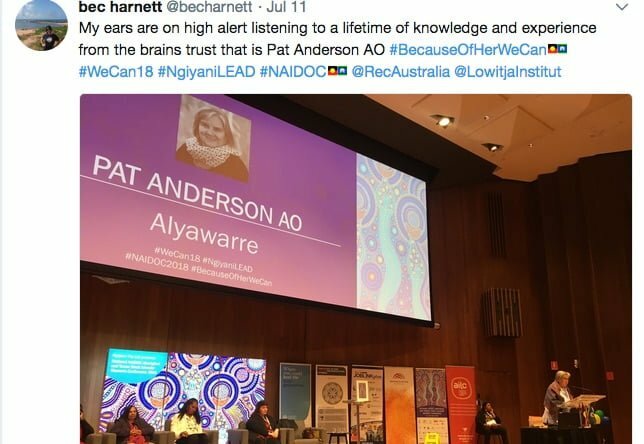 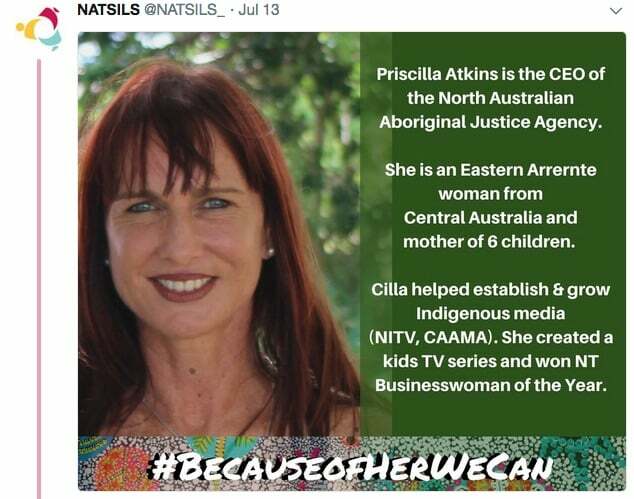 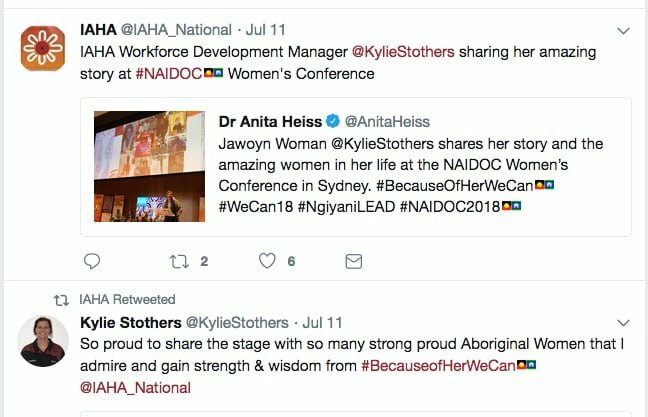 Aboriginal and Torres Strait Islander women who have provided outstanding leadership in the health sector and related domains were celebrated during a vibrant and powerful NAIDOC Week whose theme #BecauseOfHerWeCan was widely judged a great success. 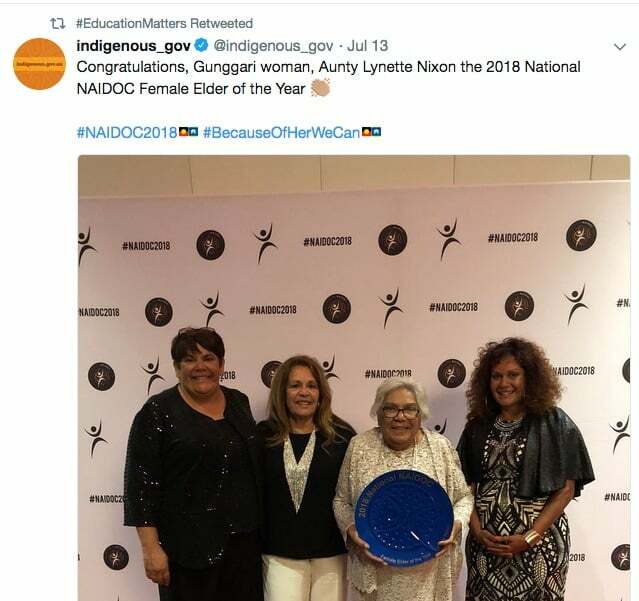 In particular, the National NAIDOC Awards recognised Pat Anderson AO, an Alyawarre woman, social justice advocate and chairperson of the Lowitja Institute, who was awarded the Lifetime Achievement Award, and Dr June Oscar AO, a Bunuba woman from Fitzroy Crossing in the Kimberley and the first female Aboriginal and Torres Strait Islander Social Justice Commissioner, who was awarded Person of the Year. 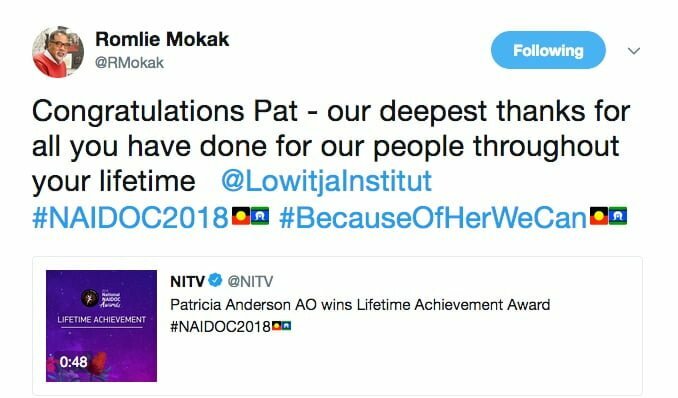 Watch short NITV profiles of Pat Anderson here and June Oscar here. 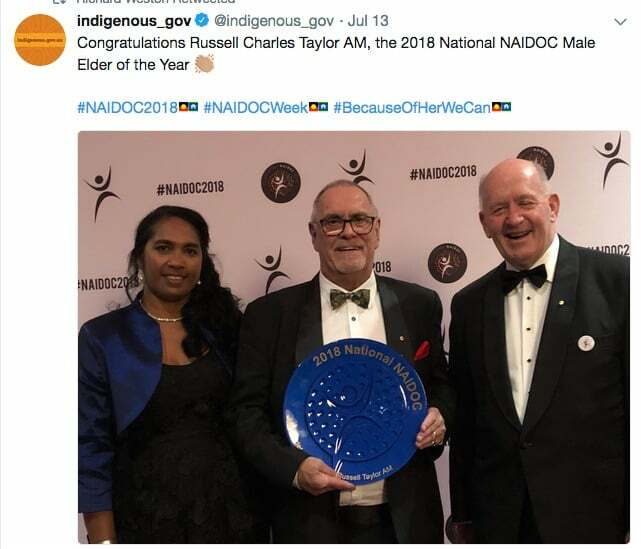 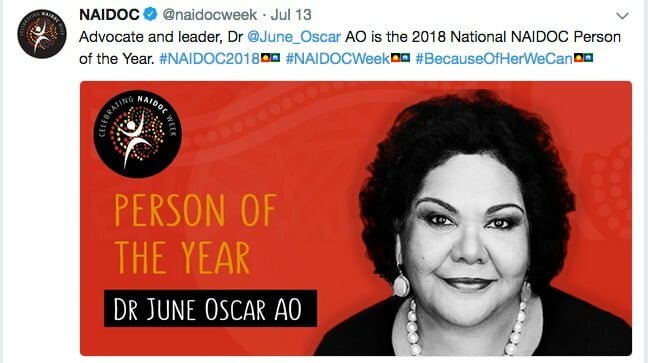 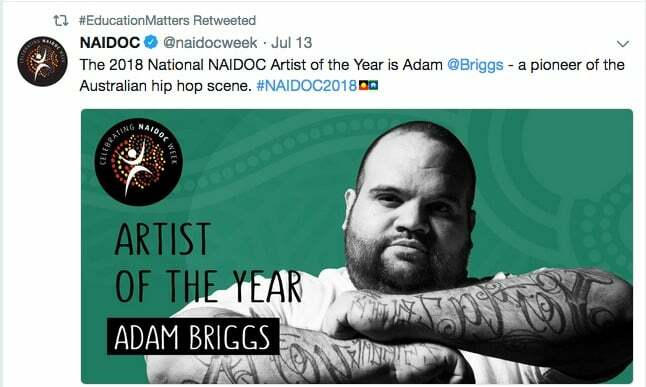 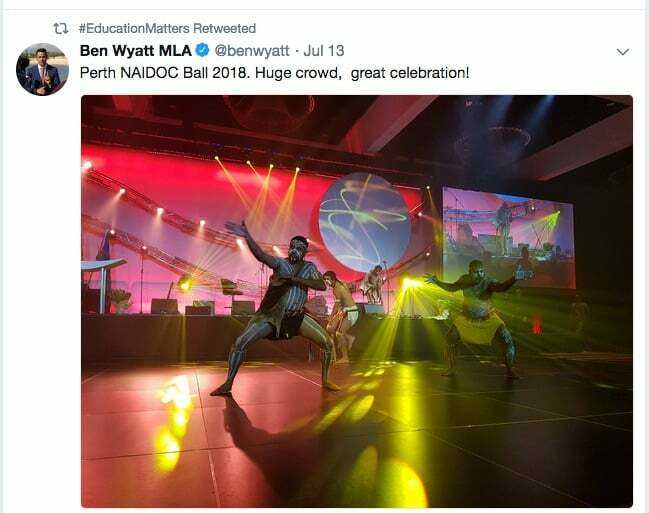 For the full list of the national awards, see here, a report from NITV, and also more details at the end of this post. 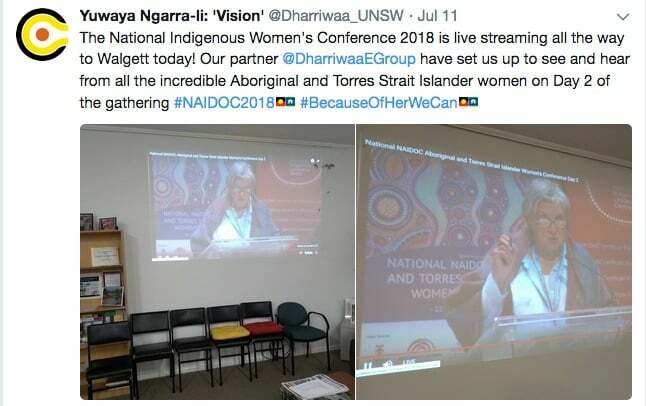 Diverse celebrations highlighted the strengths and wide-ranging achievements of Aboriginal and Torres Strait Islander women, in protecting country, culture, communities and families, and in working across multiple domains in resisting and challenging racism and other features of colonisation that affect health and wellbeing. 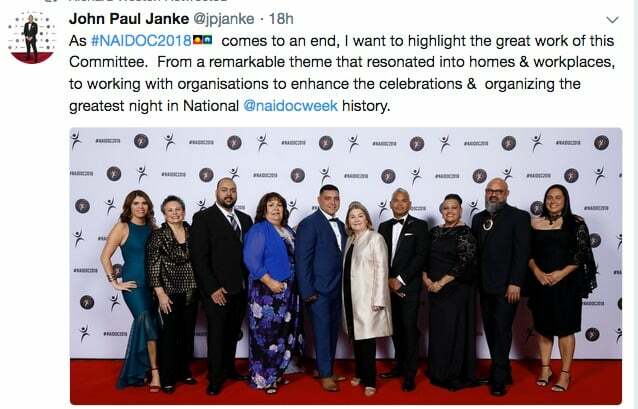 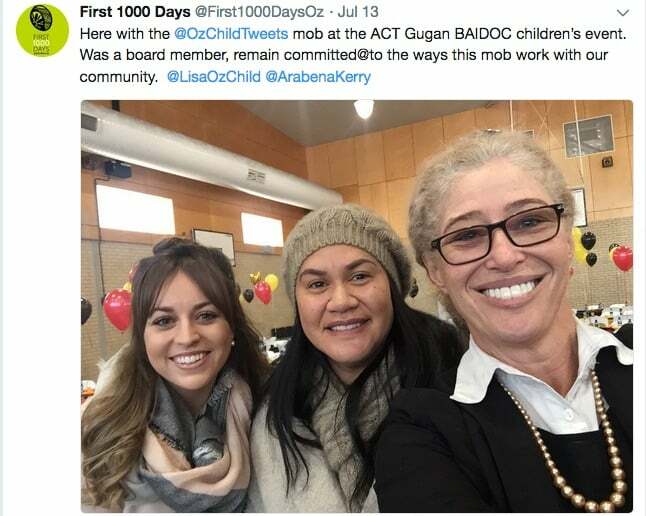 In an article published today at @IndigenousX, Antoinette Braybrook, CEO of Djirra (formerly the Aboriginal and Family Violence Prevention and Legal Service Victoria), stressed the importance of extending the acknowledgement beyond NAIDOC Week. 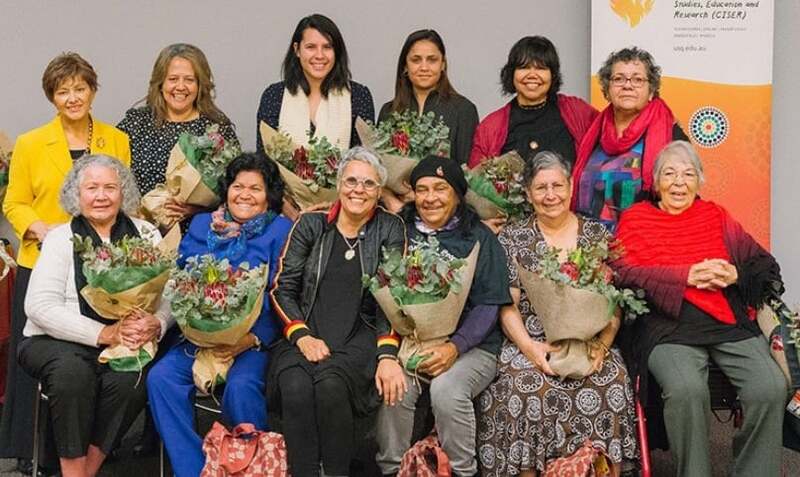 Djirra has launched a “Hidden Figures” campaign, to centre the voices of women who experience racism, poverty, violence and vilification on a daily basis, and who are too often silenced by “systemic barriers and experiences of discrimination”. 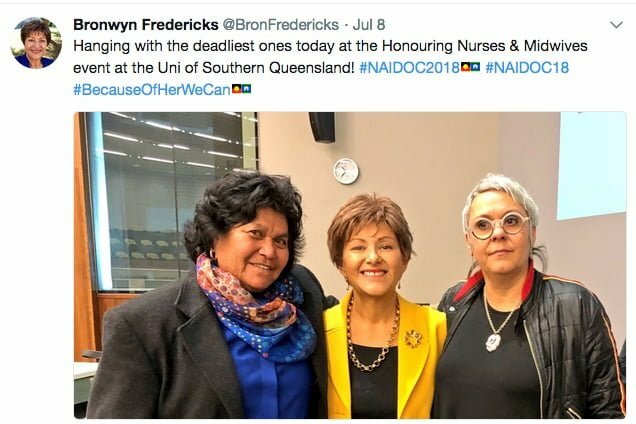 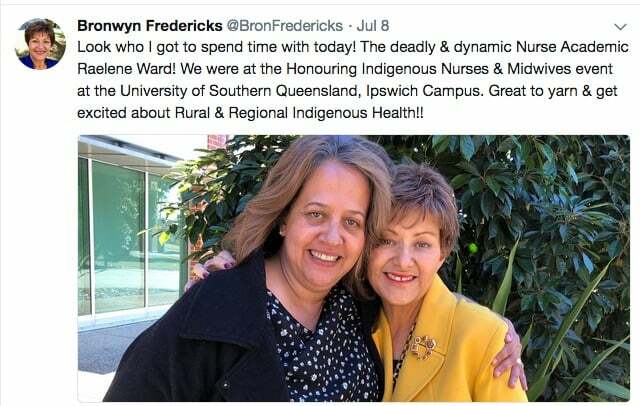 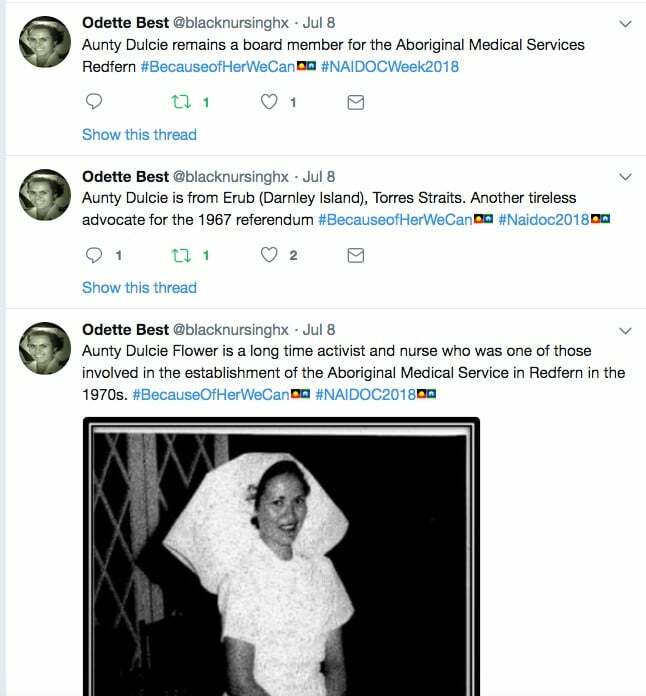 The work of health professionals and advocates was acknowledged in many settings, including at a University of South Queensland event hosted by Dr Odette Best, celebrating eight decades of Aboriginal and Torres Strait Islander nurses and midwives. 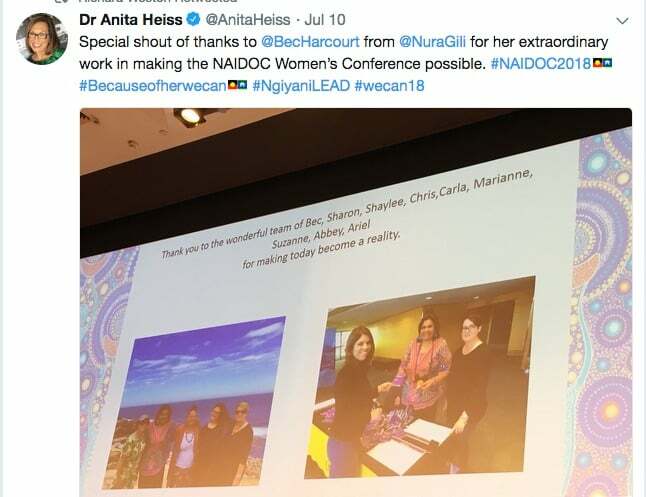 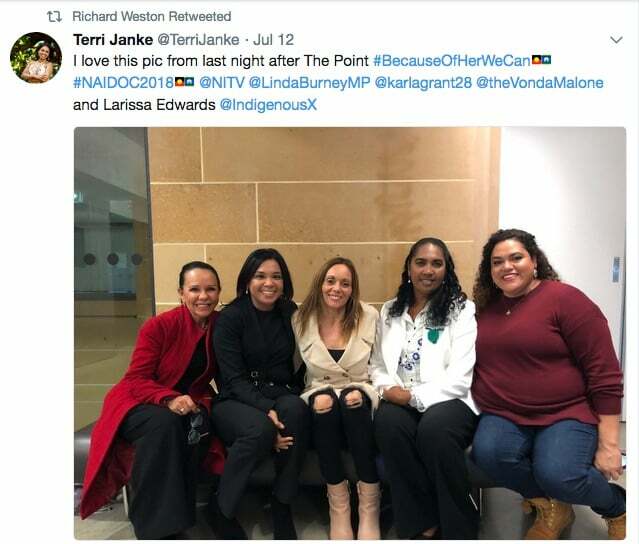 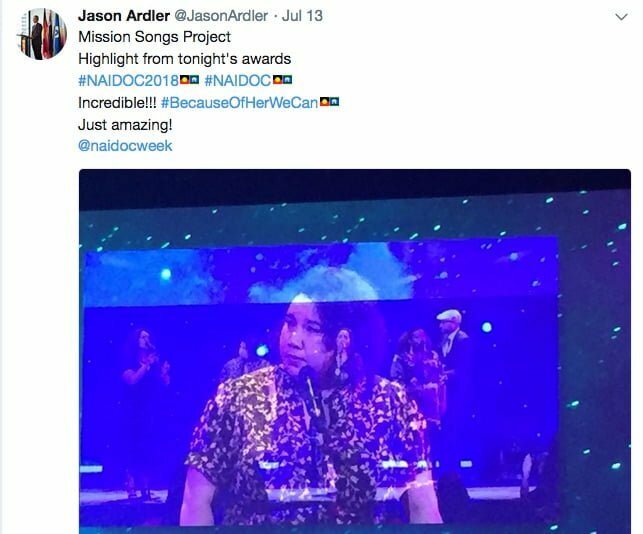 The National NAIDOC Aboriginal and Torres Strait Islander Women’s Conference in Sydney heard from woman who are “leaders, trailblazers, politicians, activists and social change advocates”. 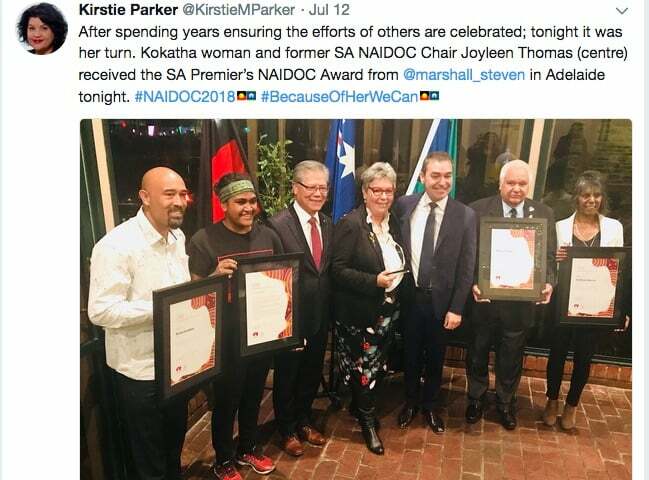 The speakers had “fought and continue to fight, for justice, equal rights, our rights to country, for law and justice, access to education, employment and to maintain and celebrate our culture, language, music and art”. 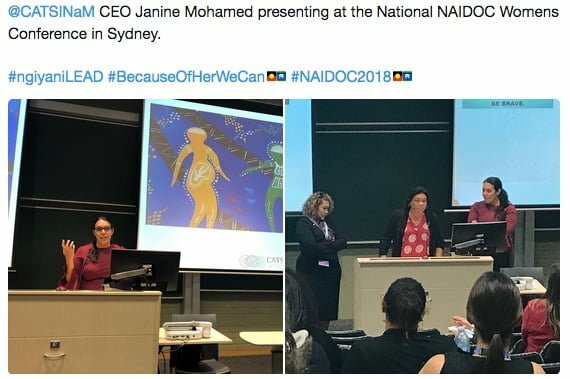 The importance of culture and identity for health and wellbeing was repeatedly highlighted. 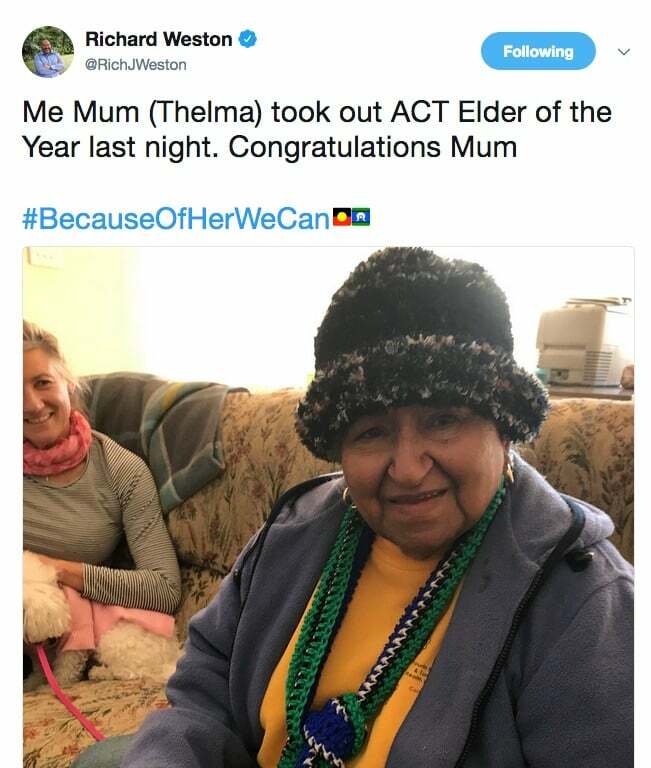 Watch this previous Croakey interview with Thelma Weston and her son Richard, CEO of the Healing Foundation. 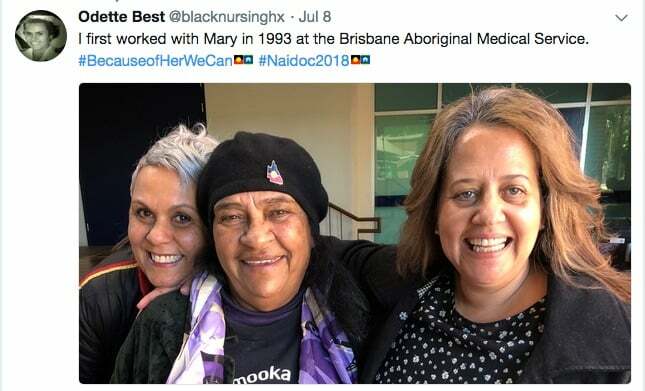 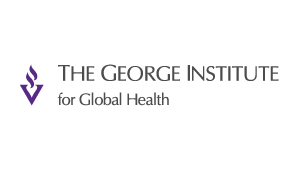 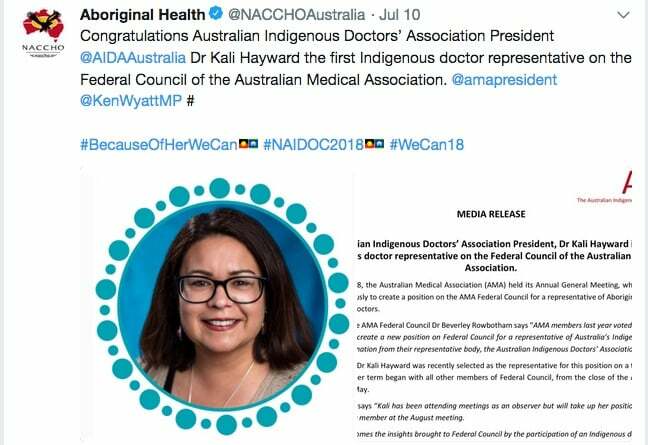 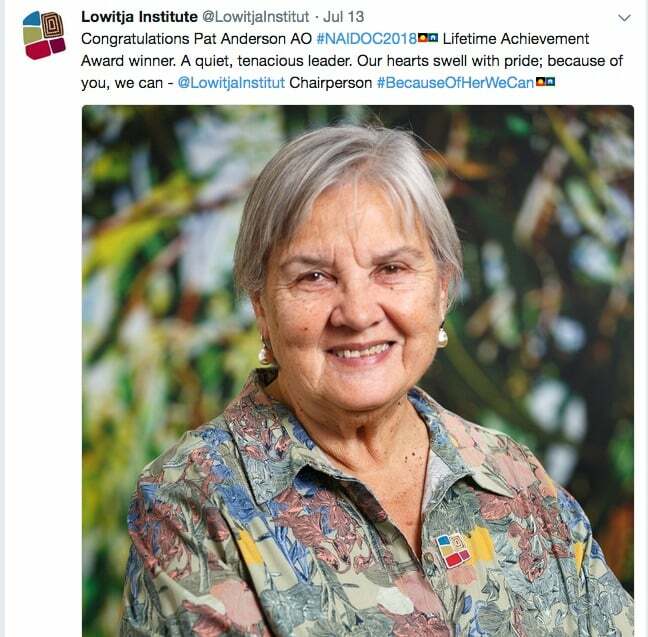 At 82, she is “a driving force in the Aboriginal and Torres Strait Islander Health Workforce”, and an ACT board director for the National Aboriginal and Torres Strait Islander Health Worker Association. 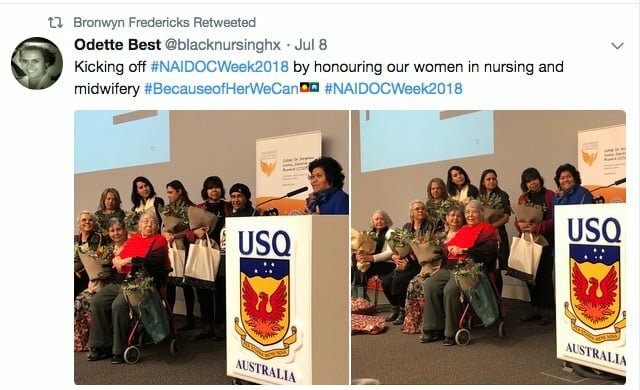 At CATSINaM, we take extra pleasure this year in celebrating NAIDOC Week because it offers such a wonderful opportunity to pay our respects to all the deadly Aboriginal and Torres Strait Islander nurses and midwives who have come before us, paving the way for our current and future generations to follow. 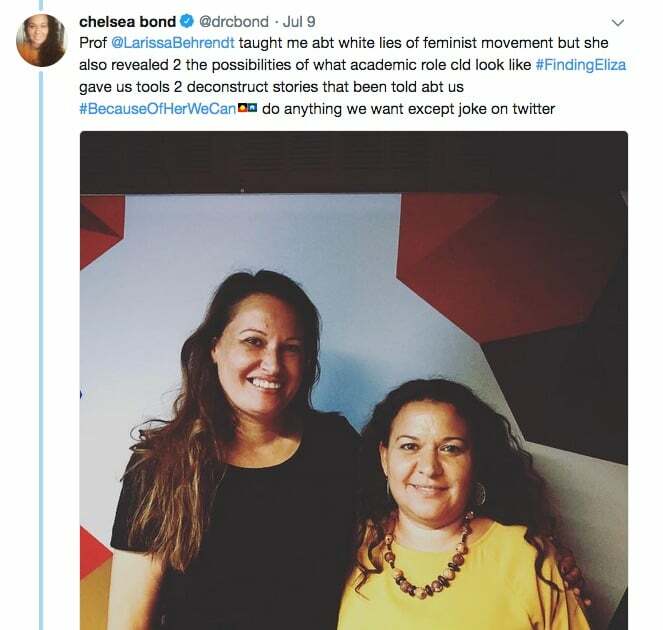 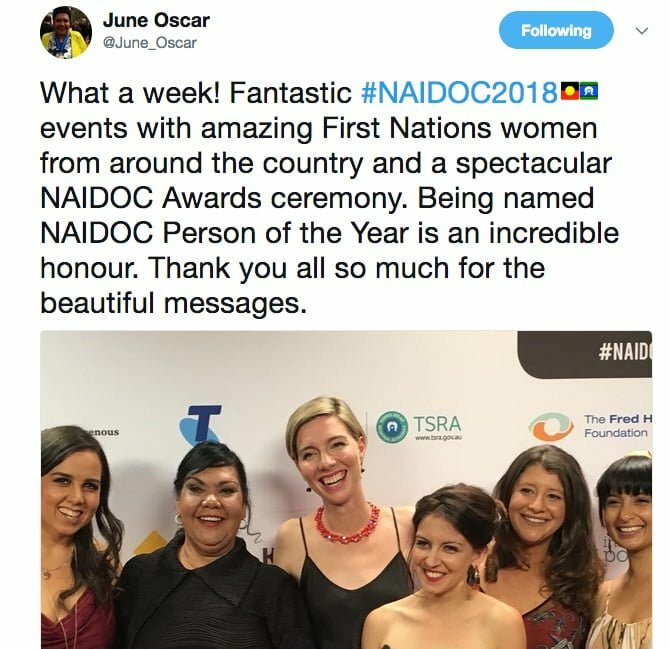 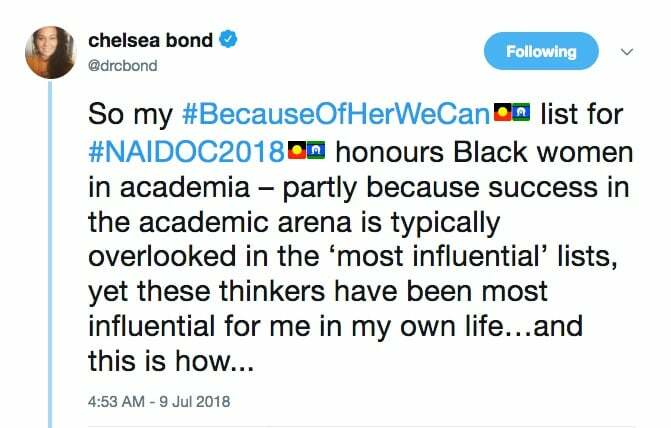 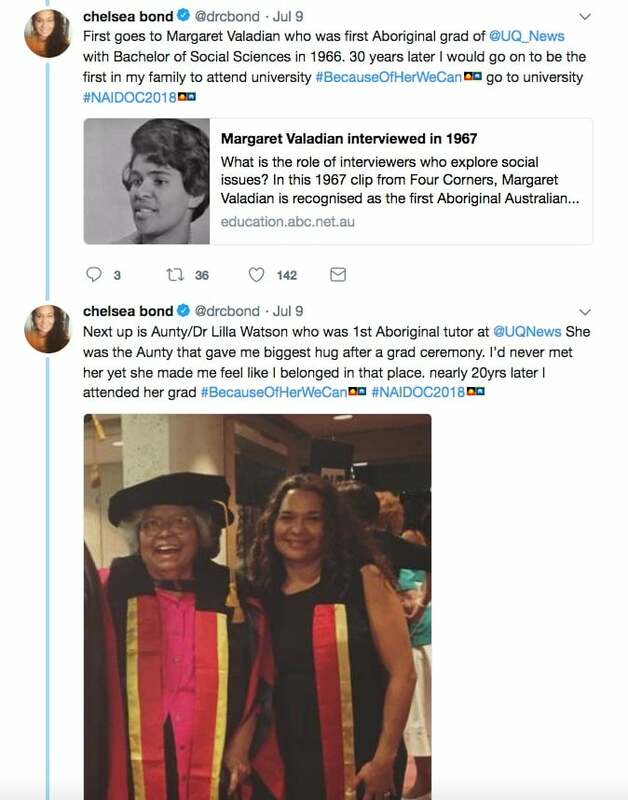 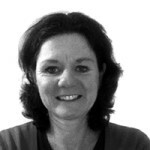 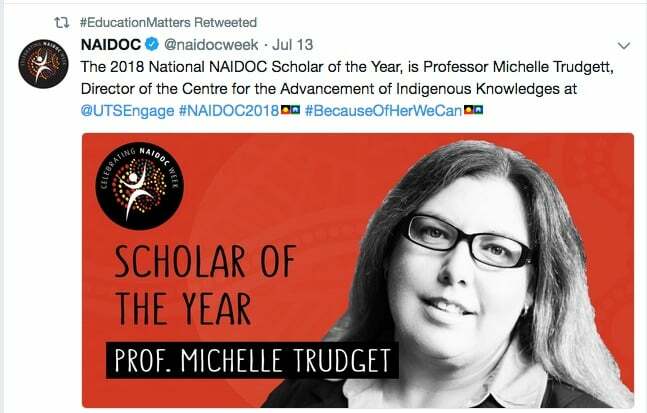 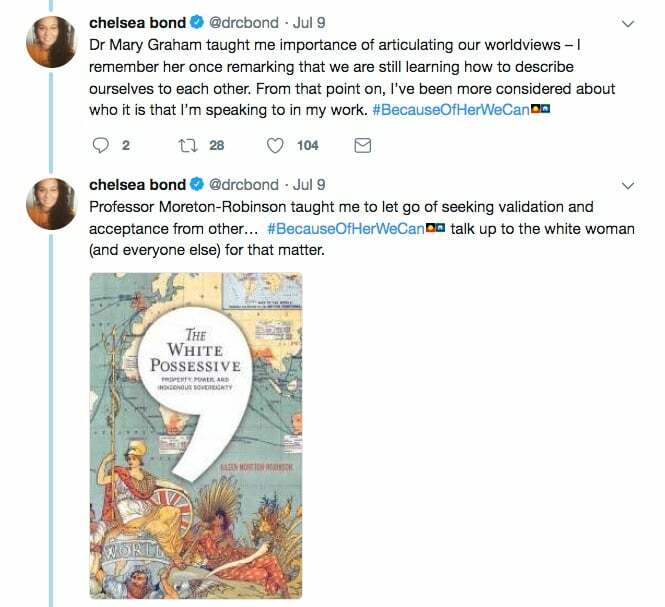 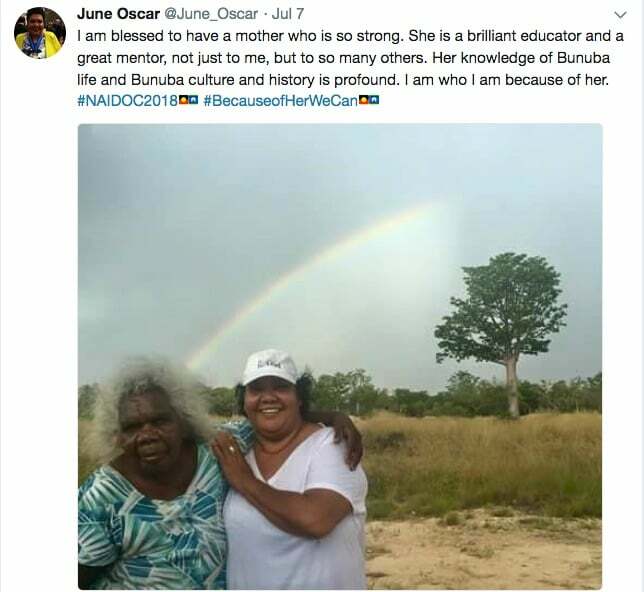 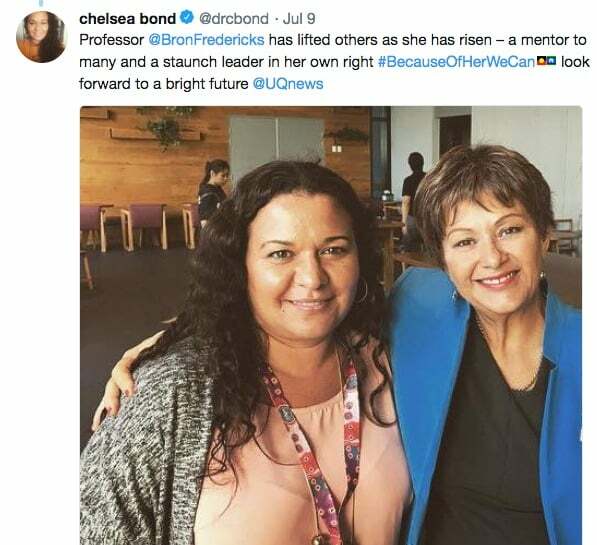 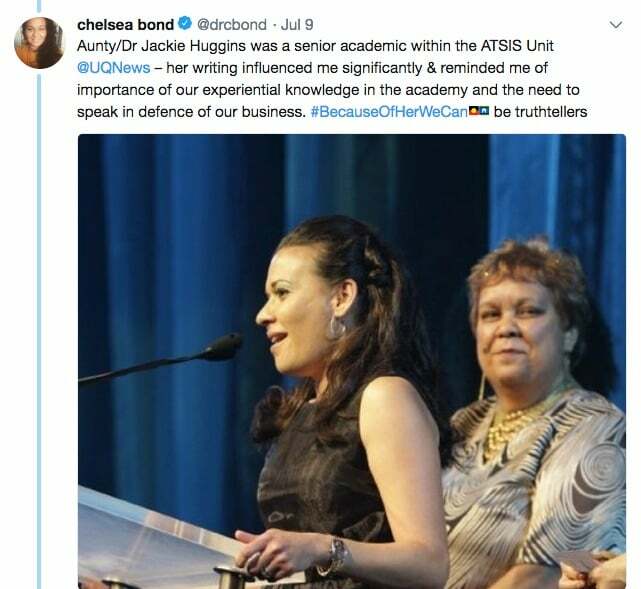 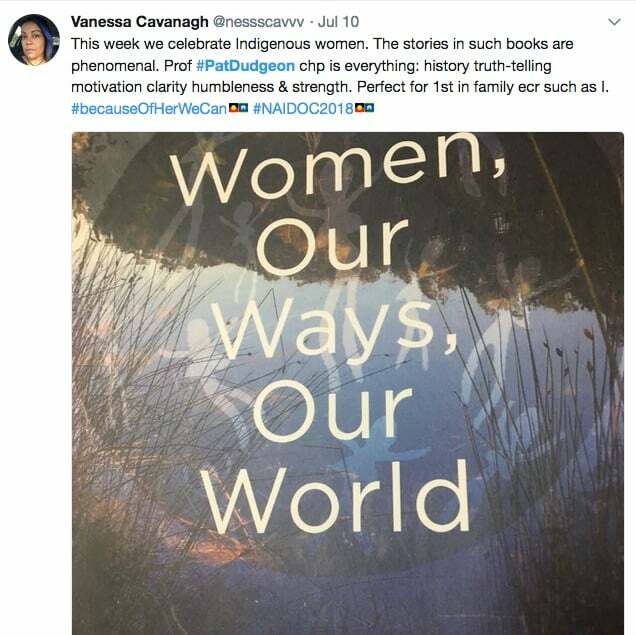 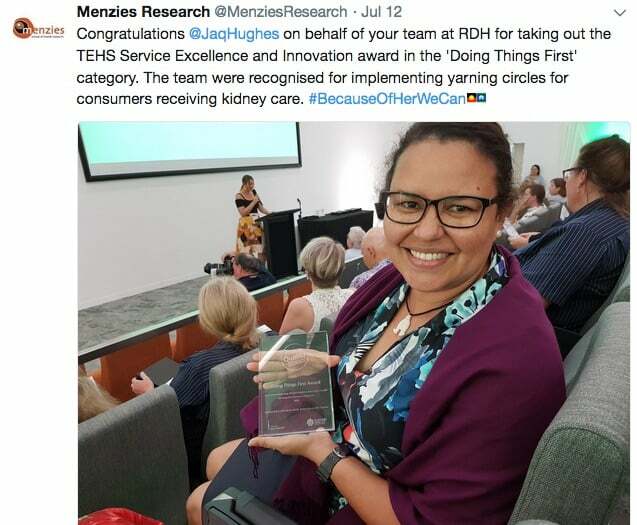 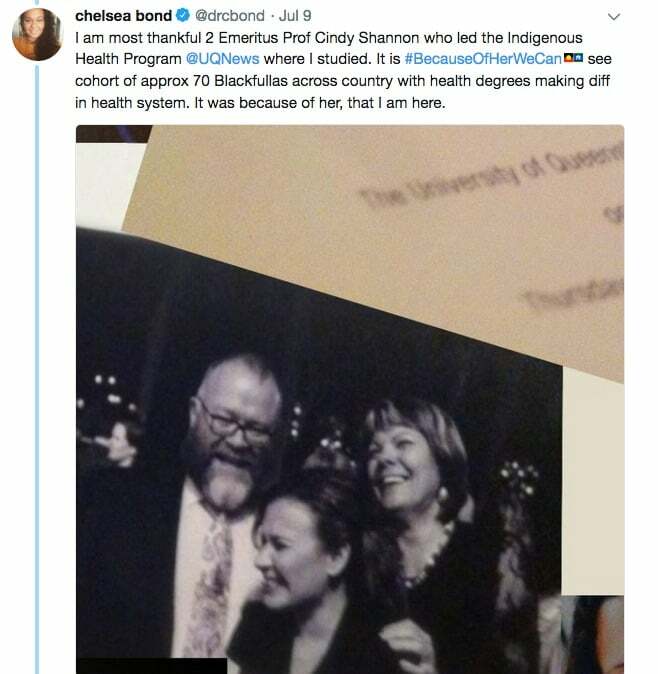 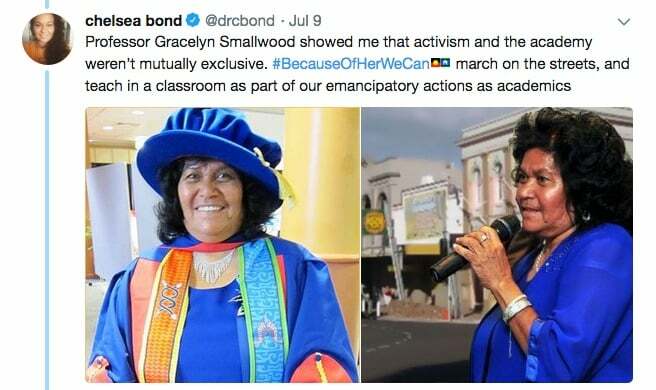 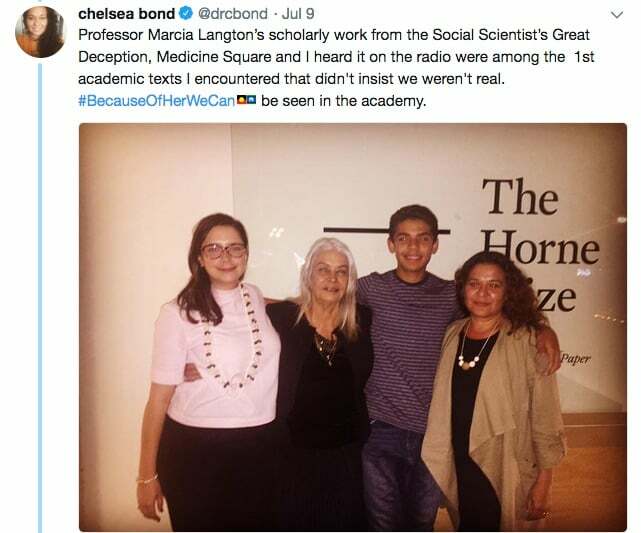 Dr Chelsea Bond from the University of Queensland paid a personal tribute to Aboriginal and Torres Strait Islander women’s leadership in the academy; see her Twitter thread here. 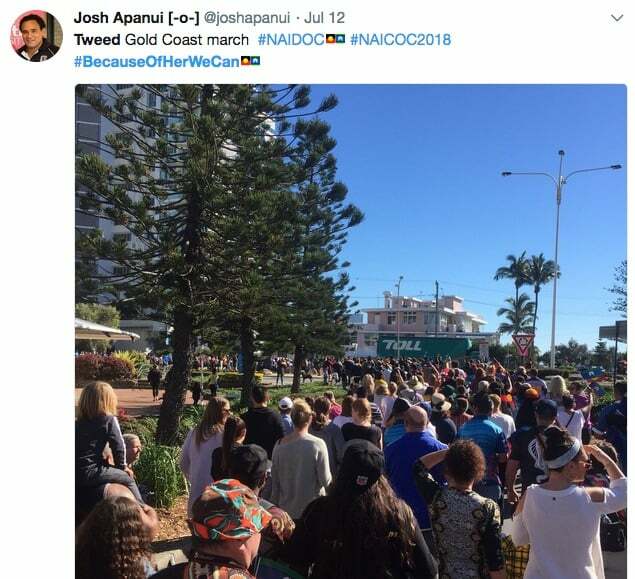 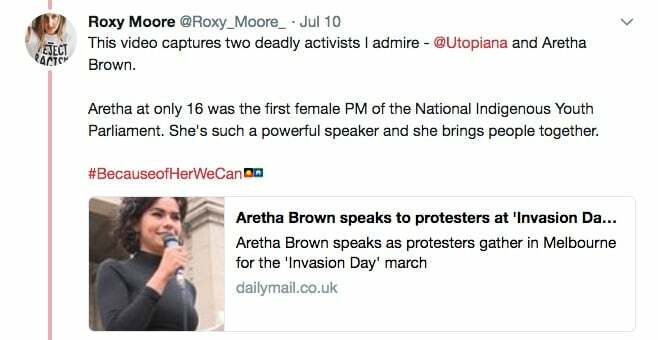 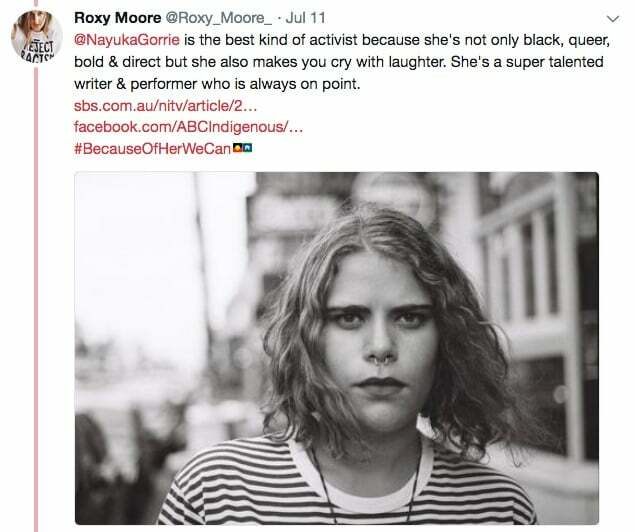 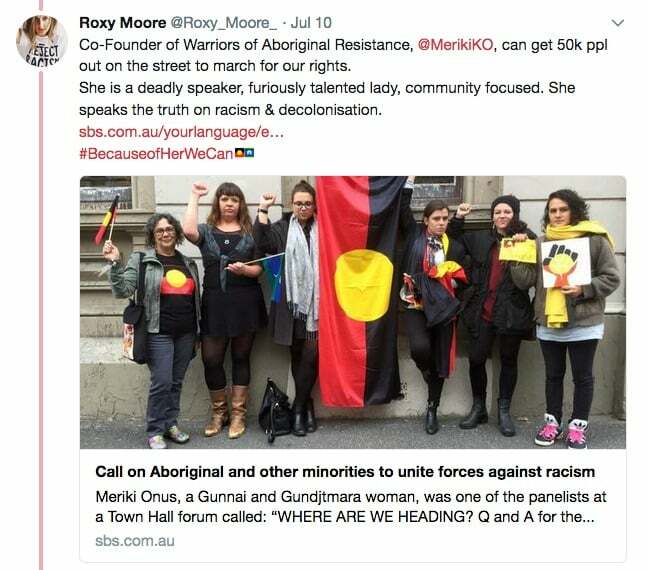 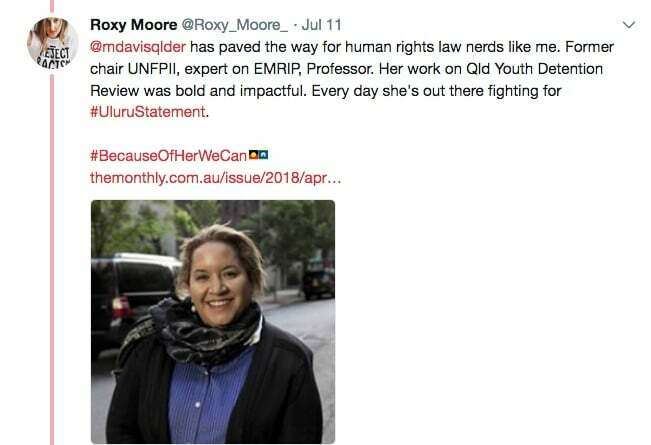 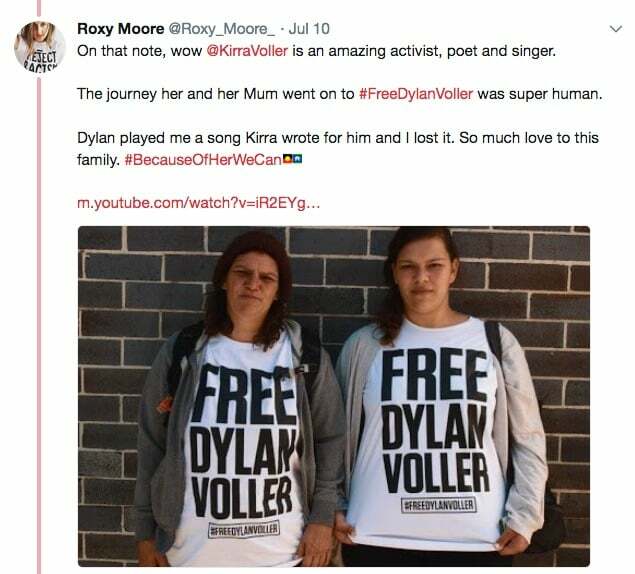 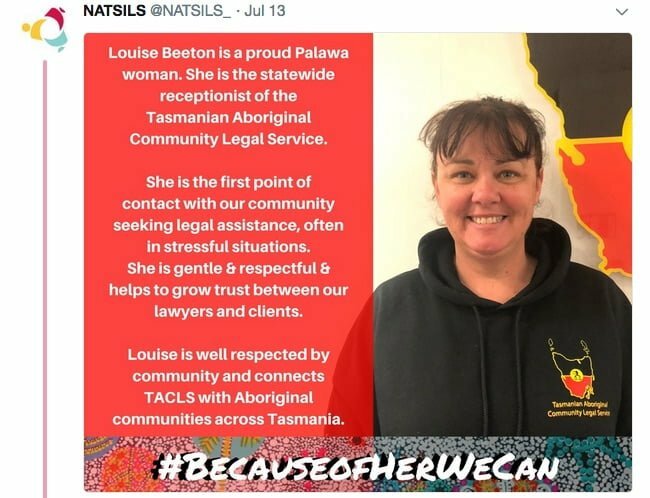 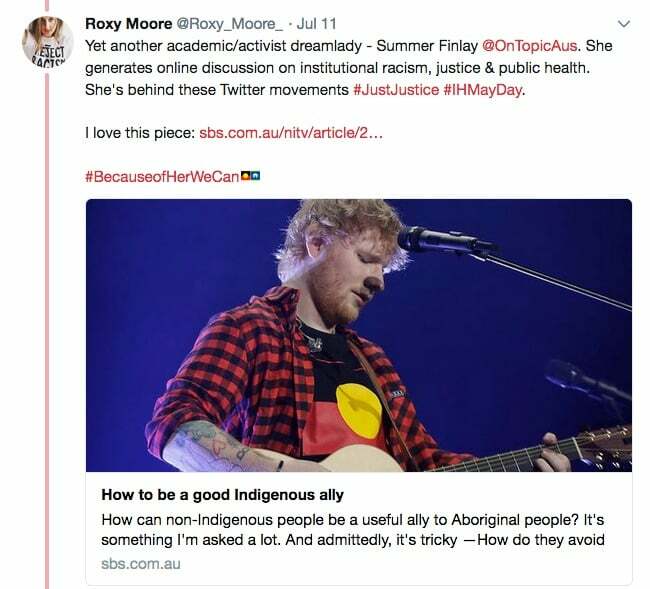 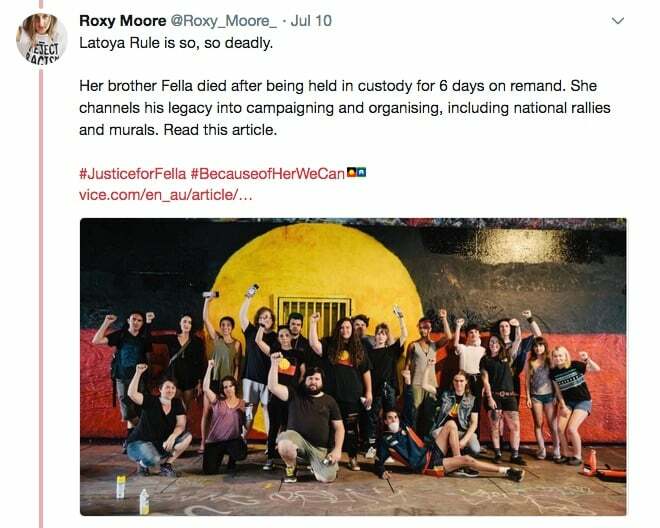 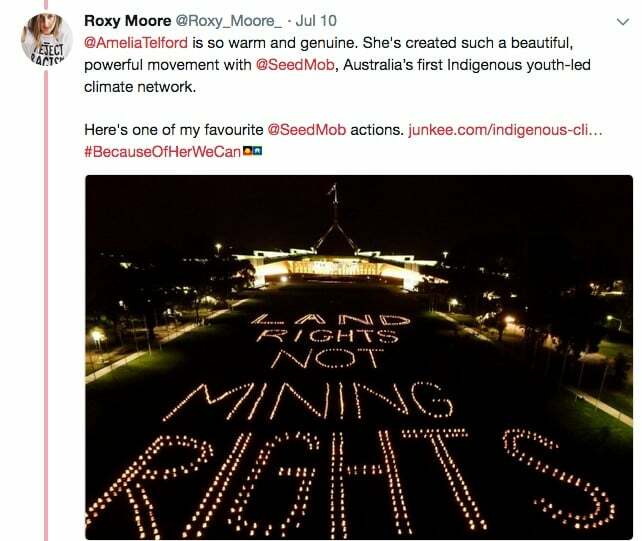 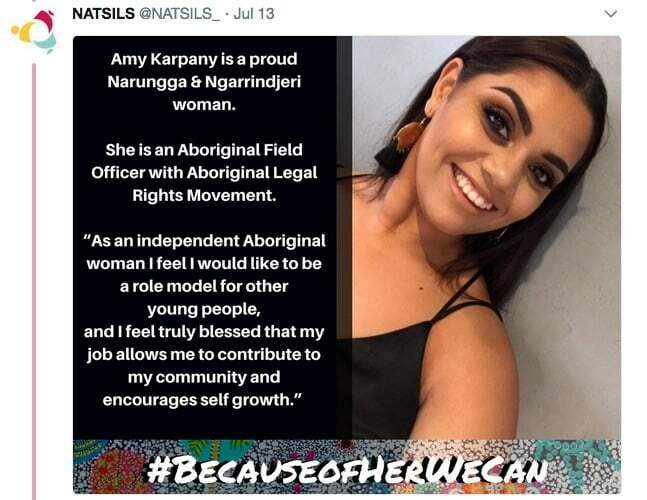 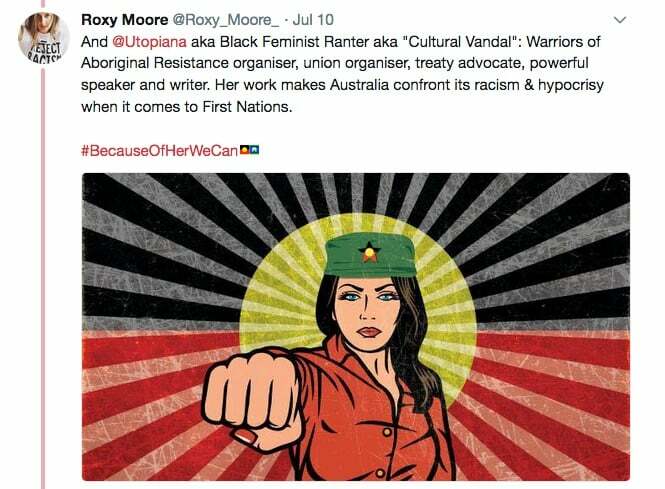 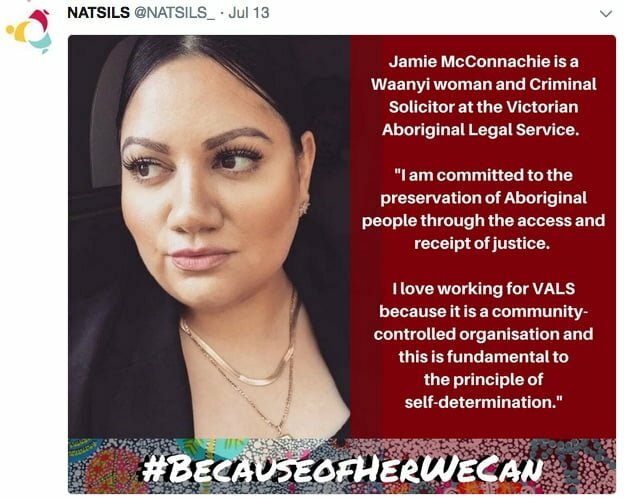 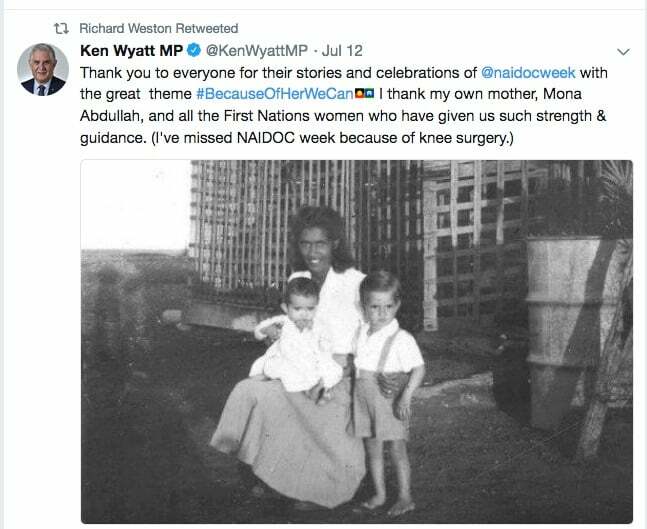 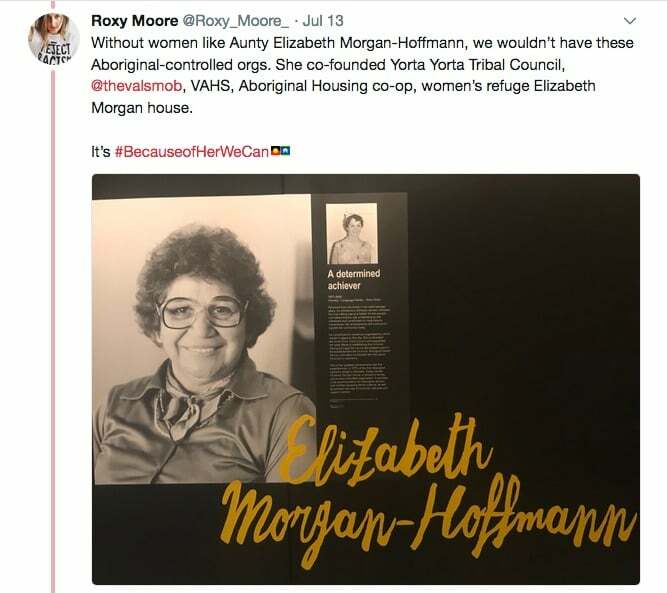 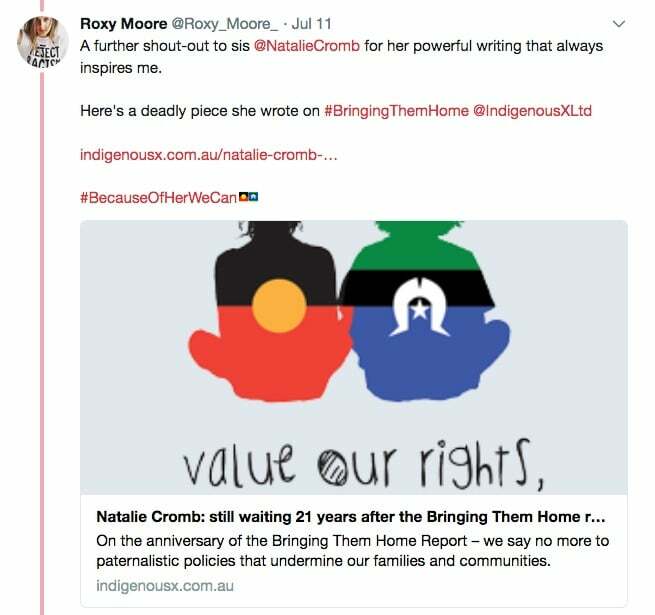 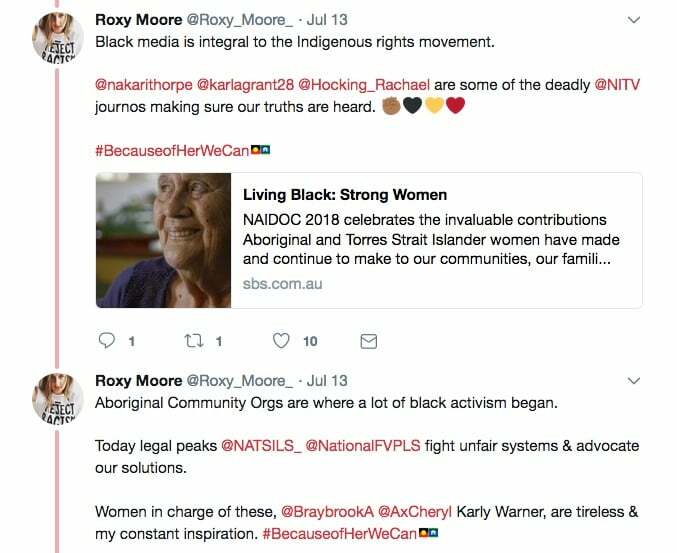 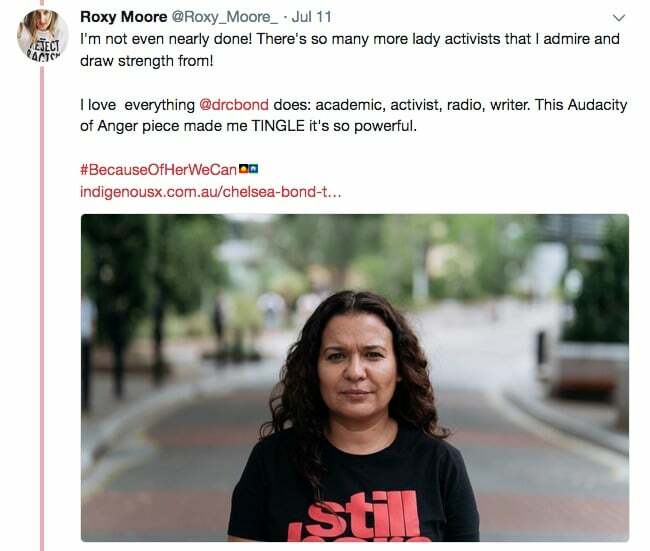 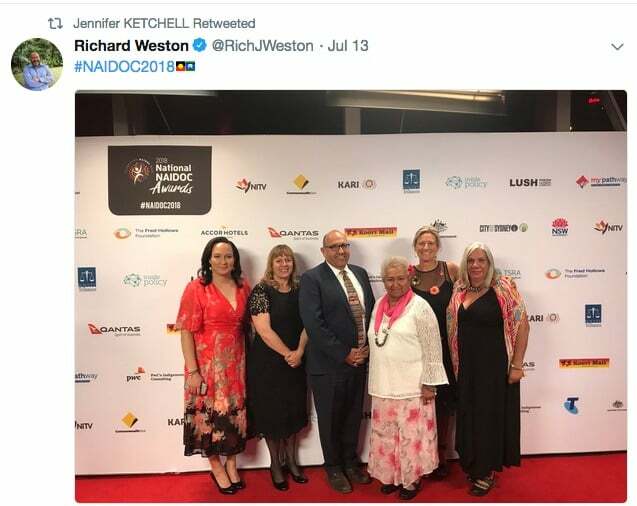 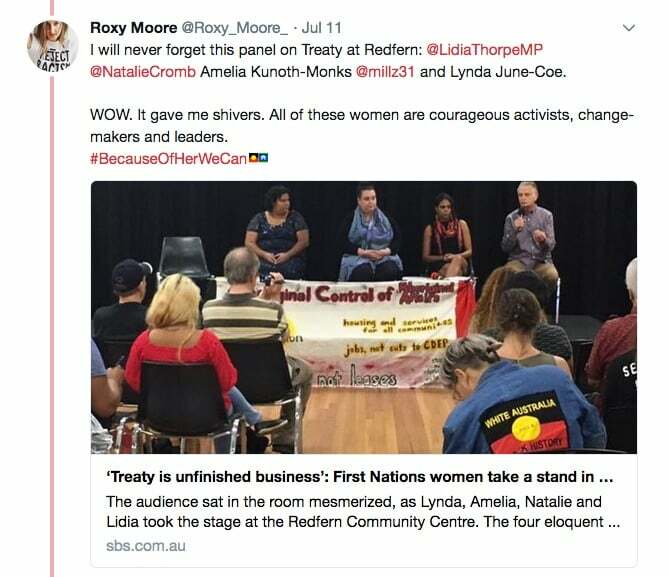 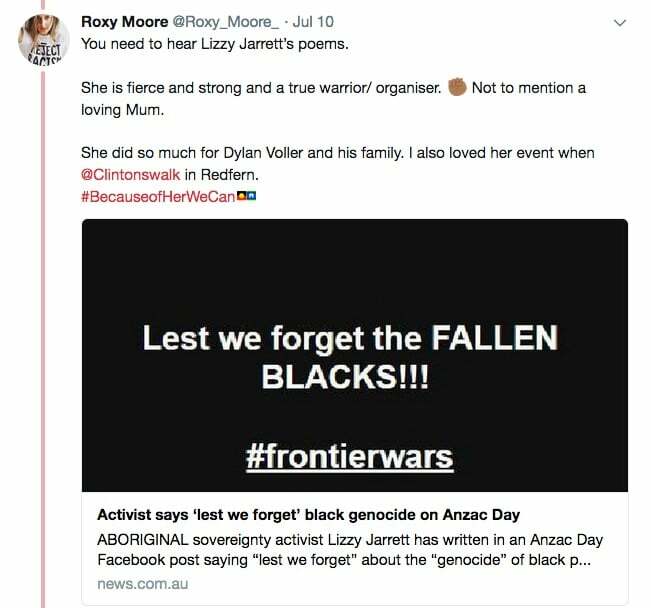 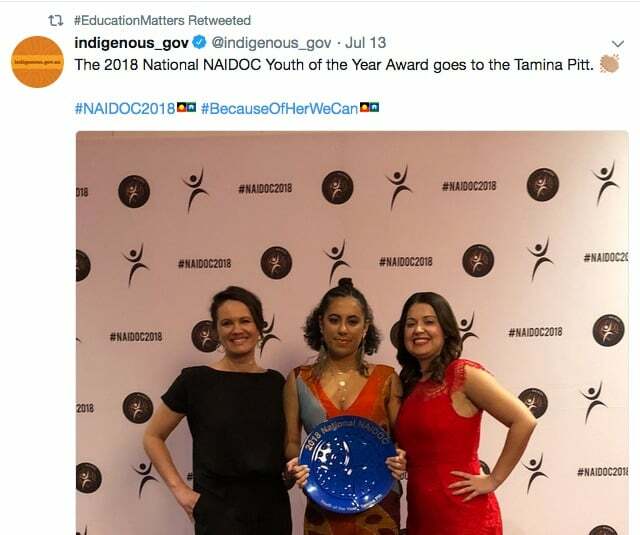 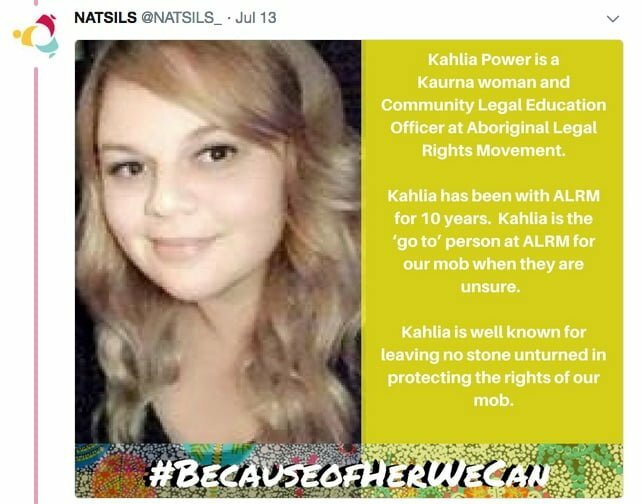 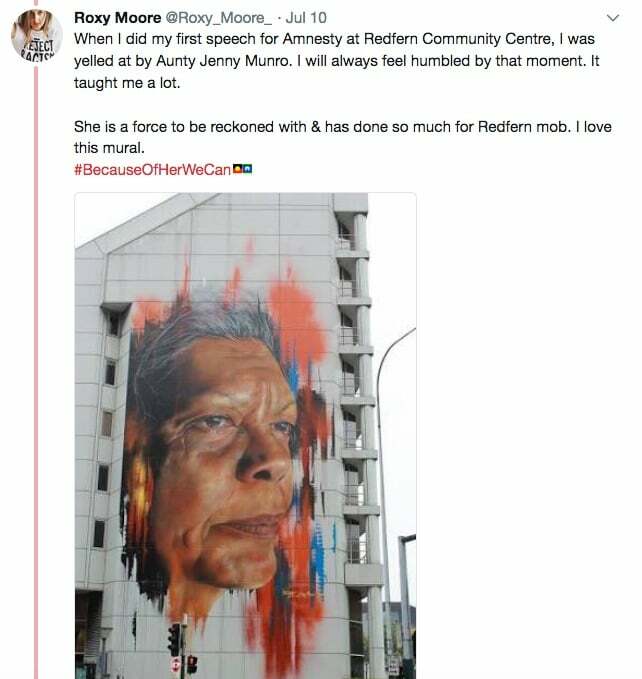 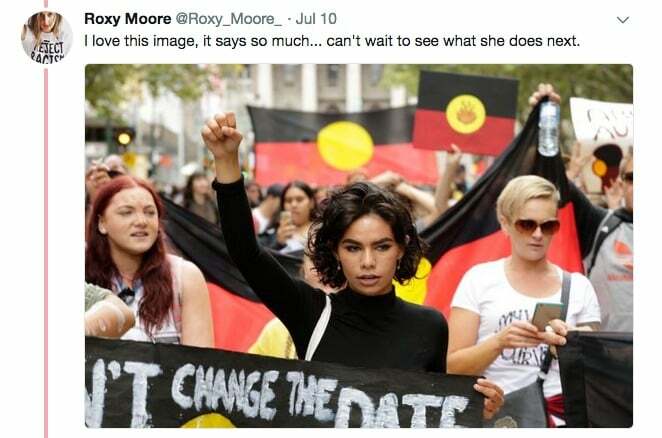 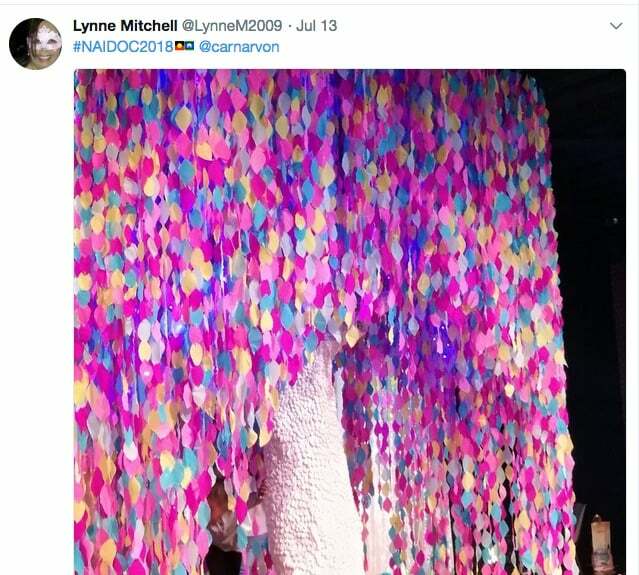 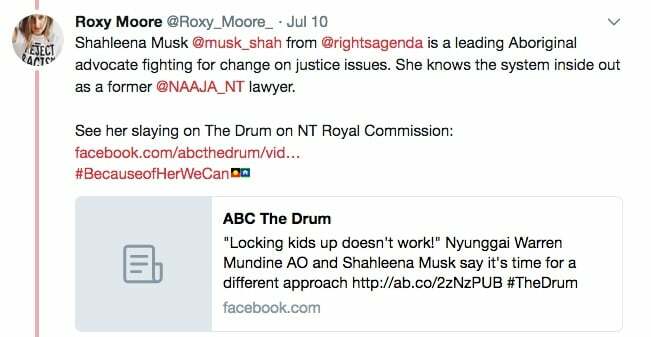 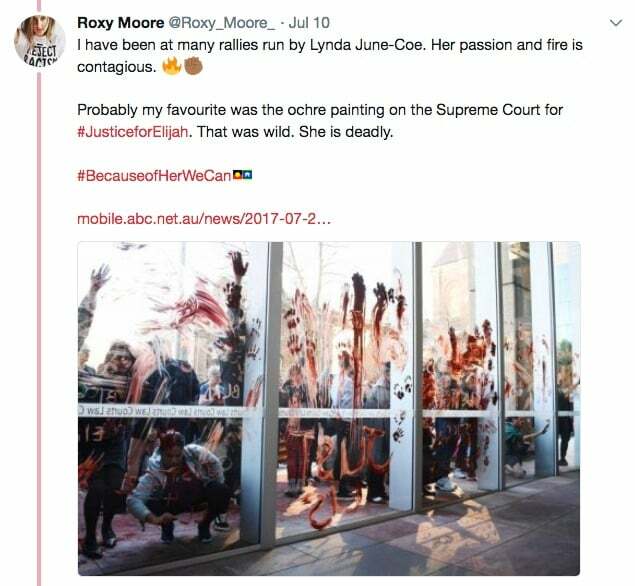 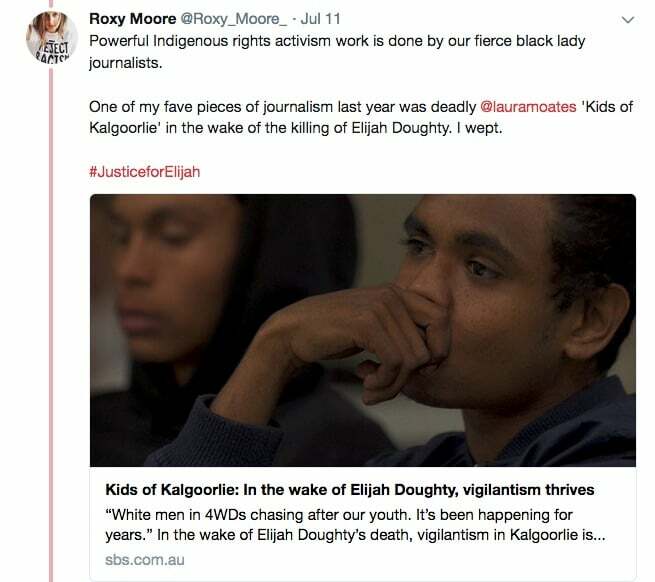 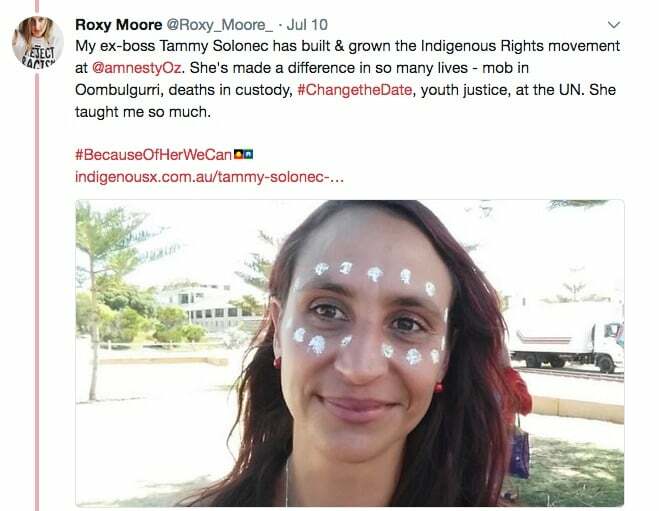 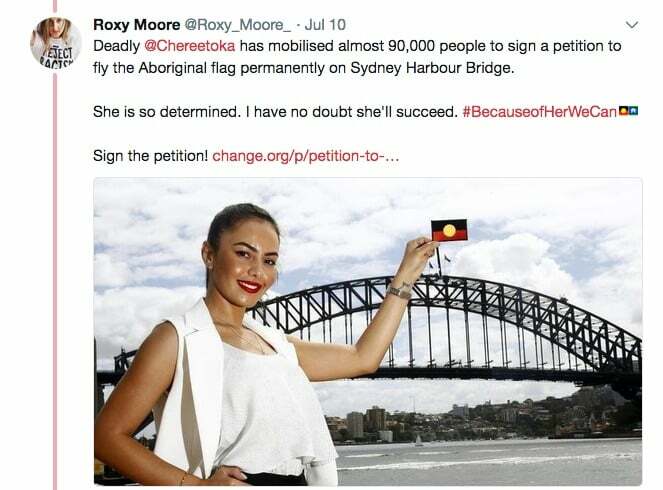 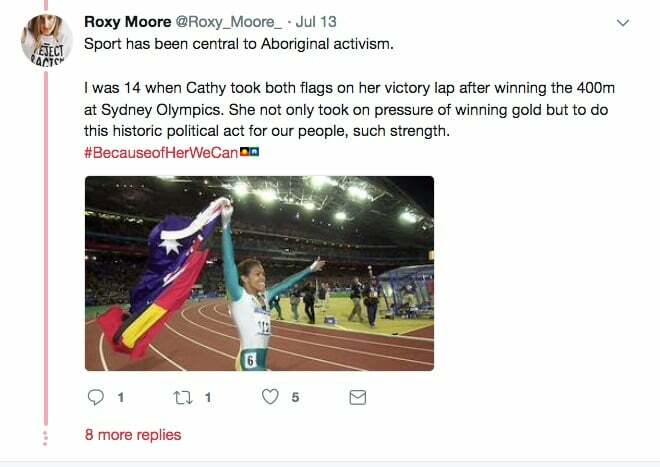 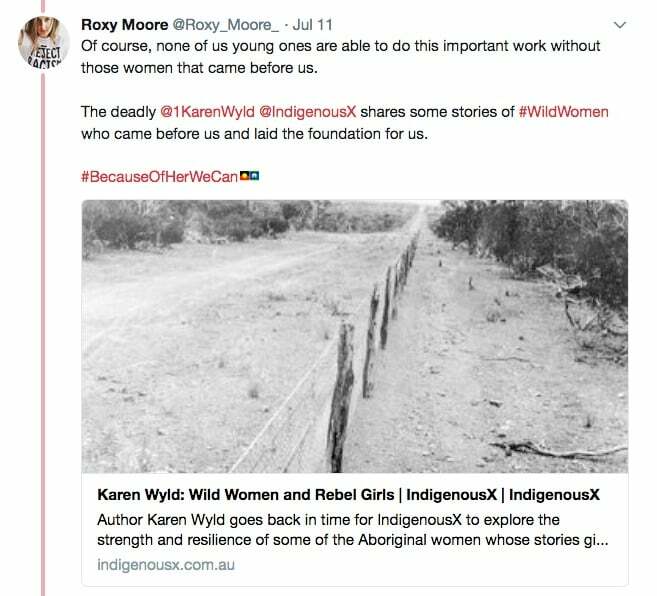 Roxy Moore from National Aboriginal and Torres Strait Islander Legal Services (NATSILS) paid tribute to women on the frontline of activism; read her Twitter thread here. 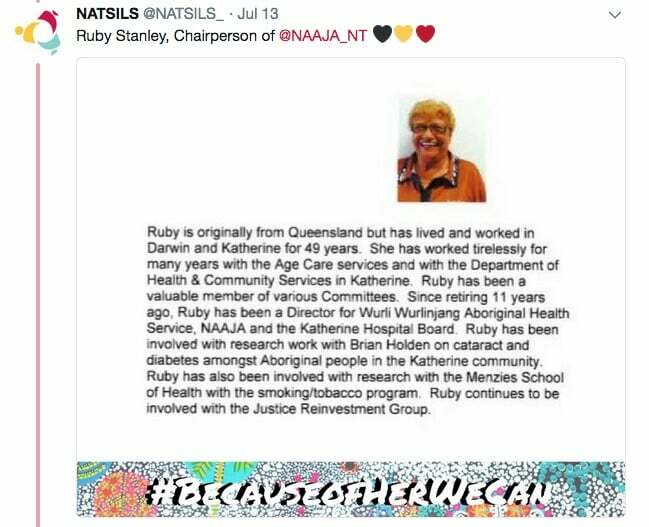 You can also read the NATSILS Twitter thread here. 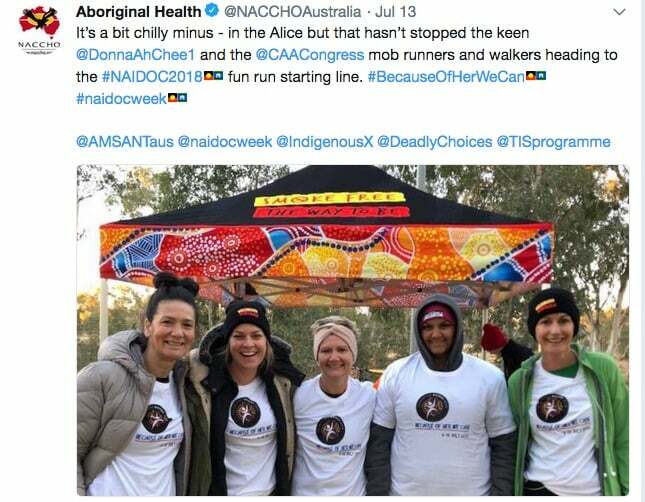 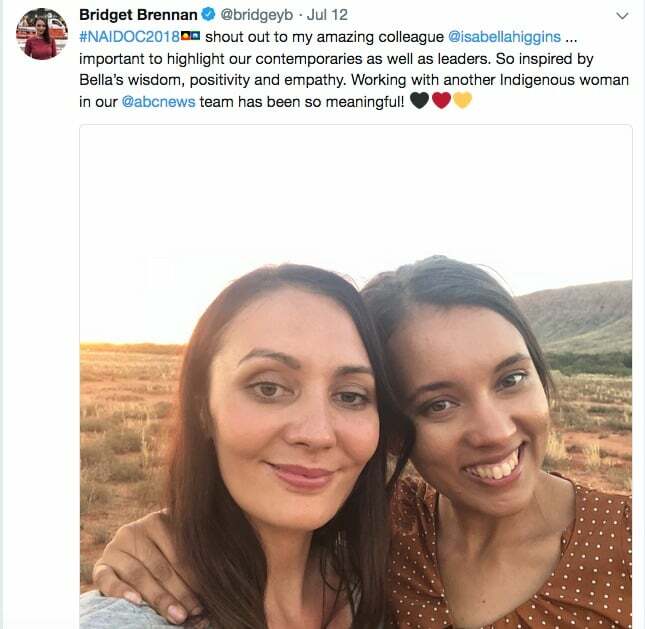 NAIDOC Week also provided an opportunity for profiling the contributions of Aboriginal and Torres Strait Islander women to the media industry, which has such a powerful role in shaping the narratives that influence health and wellbeing. 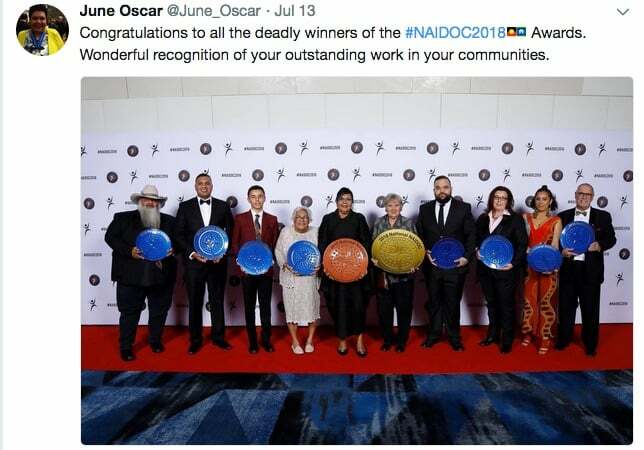 Full awards details are available here. 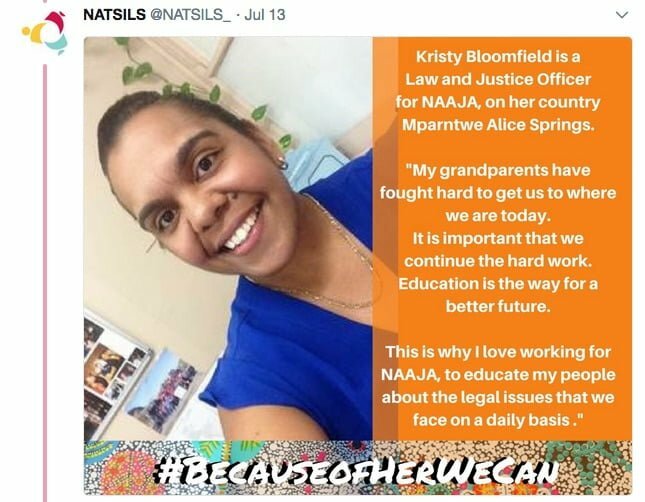 Aboriginal and Torres Strait Islander women possess a strength and resilience which most people cannot even begin to comprehend. 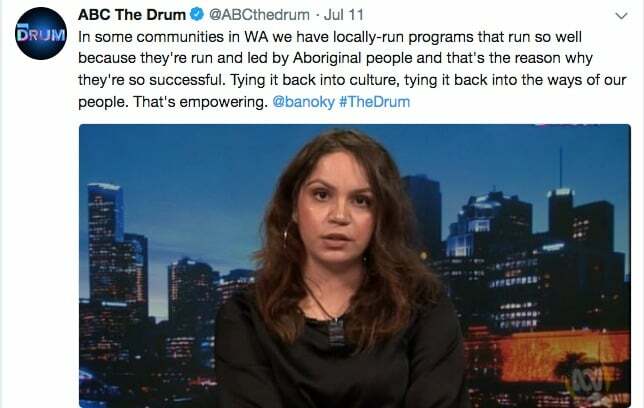 We are the backbone of our communities. 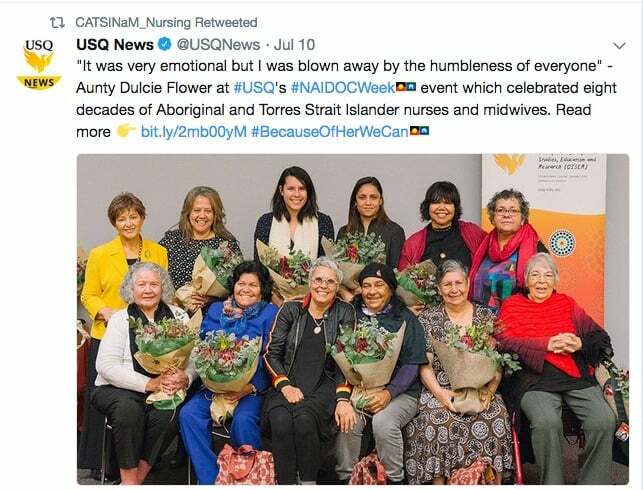 We are the life-givers, the nurturers and the carers. 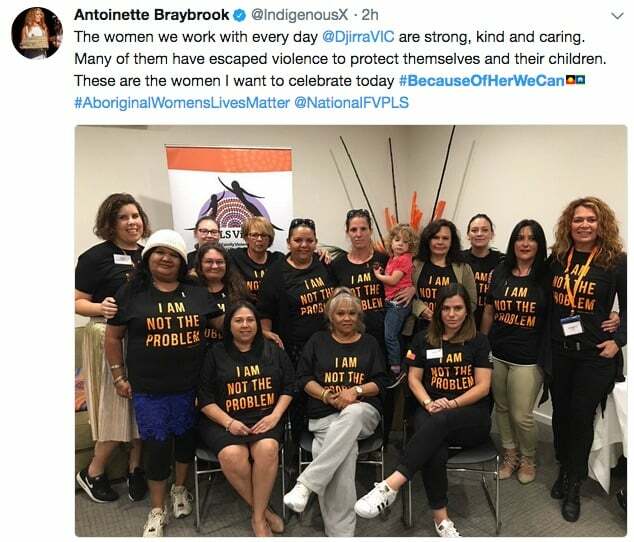 We are equally leaders, elders, role models and activists. 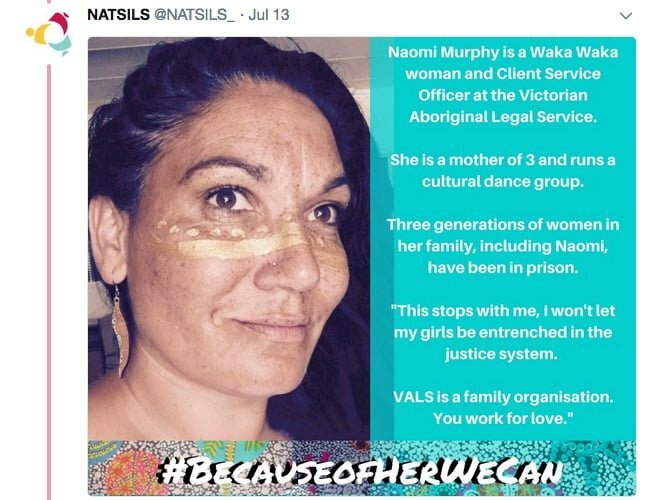 We advocate fiercely for our own and work tirelessly every day for change. 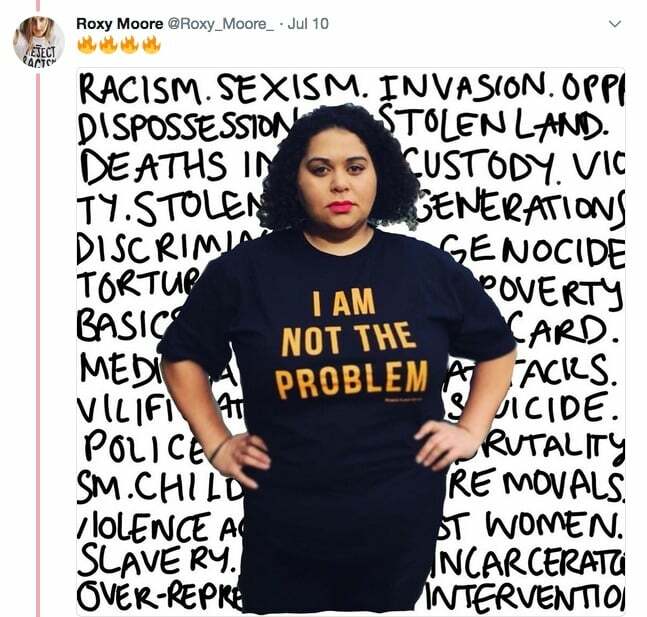 “While we are not heard, structural racism pervades our institutions and public spaces. 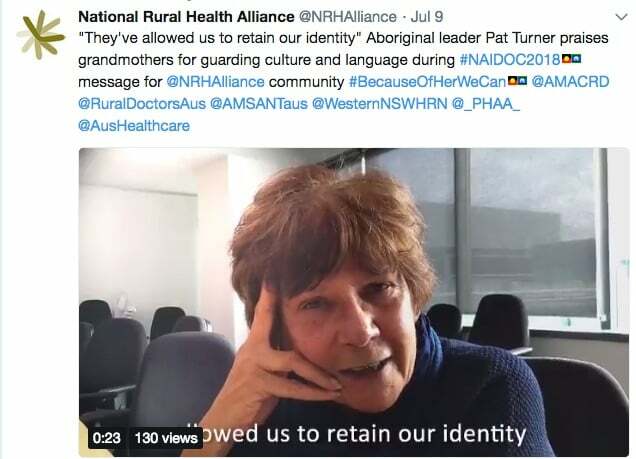 This racism intersects with multiple forms of discrimination, further entrenching intergenerational trauma. 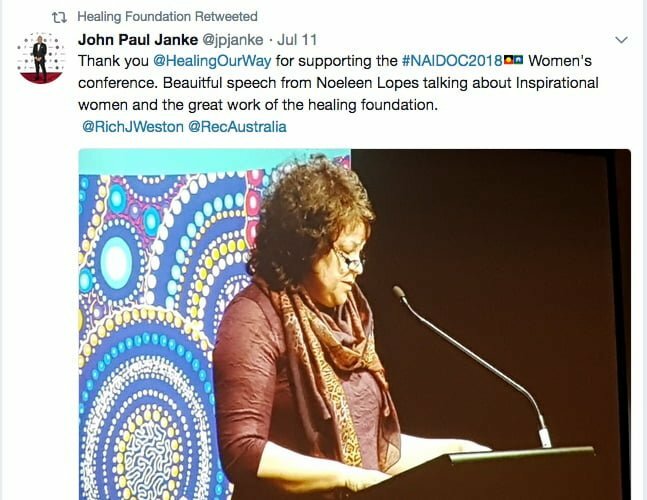 This has a disproportional impact on our women. 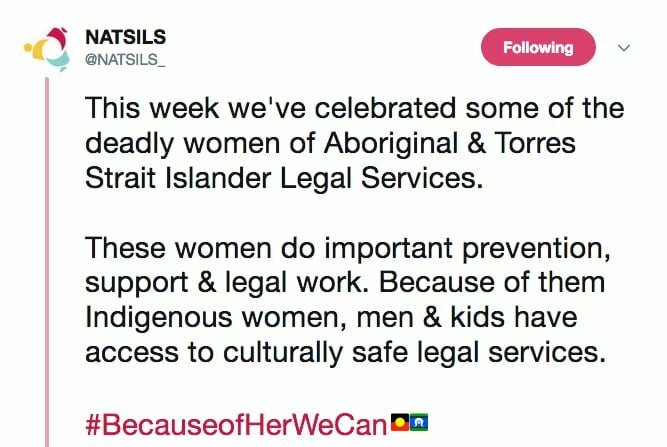 When our work should be celebrated and applauded, we are too often exposed to punitive legal and welfare systems that diminish who we are, and consequently curtail all our people’s rights and freedoms. 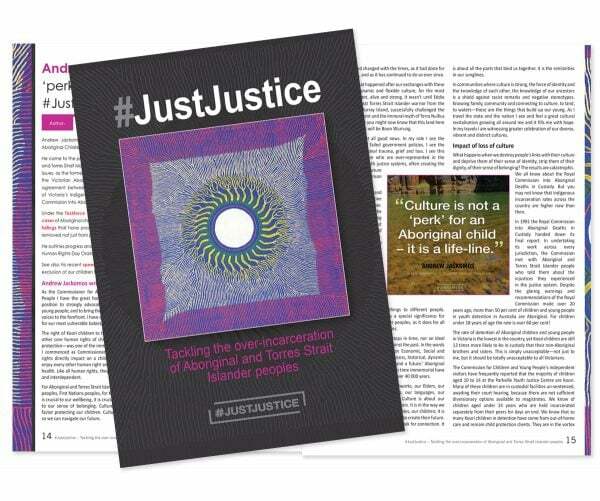 The statistics of rising incarceration rates are evidence of punitive policies at work, entrenching cycles of poverty and abuse. 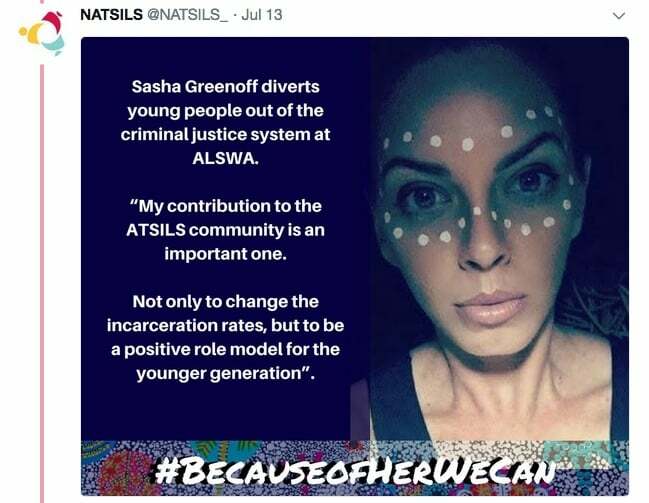 It saddens me to think about what our women in jail could have achieved if they had not been systematically failed by Australian society. 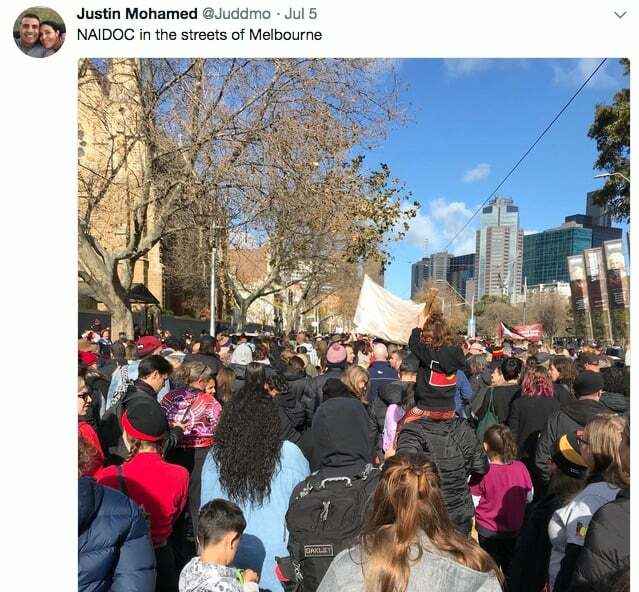 I wonder if these people know that the majority of people who are in jail have not been sentenced. 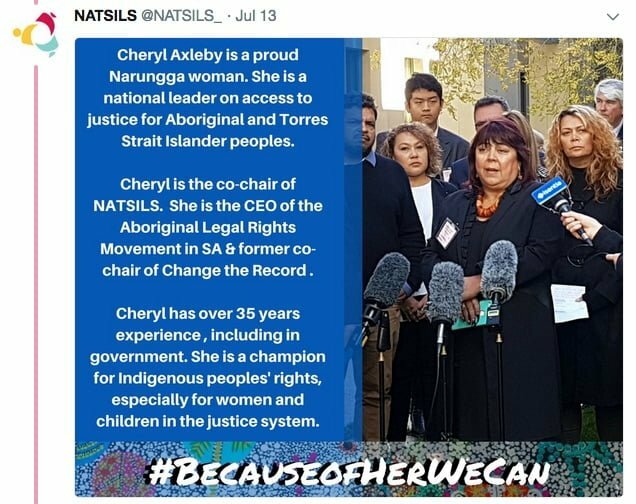 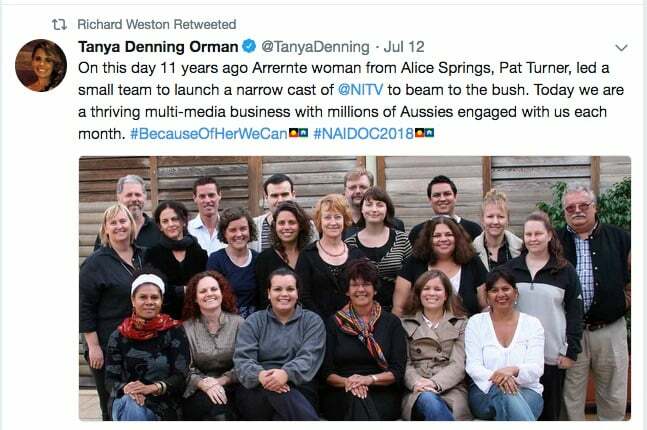 NITV: Five Indigenous women who didn’t get the credit. 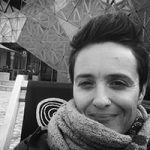 ABC: Some personal stories behind the theme. 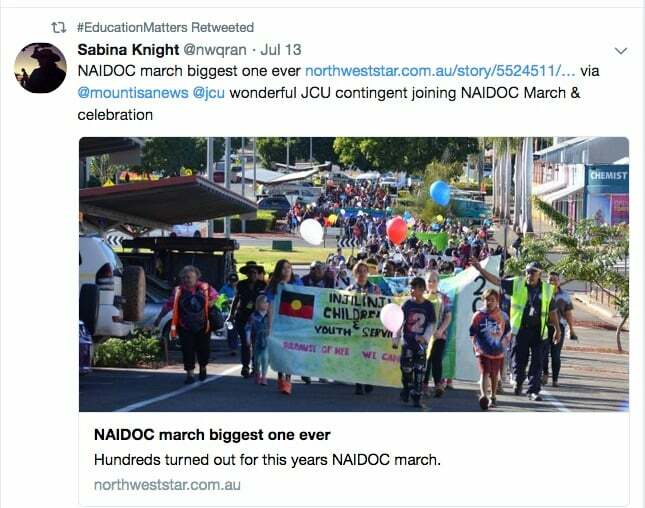 NITV: Stories submitted by community members. 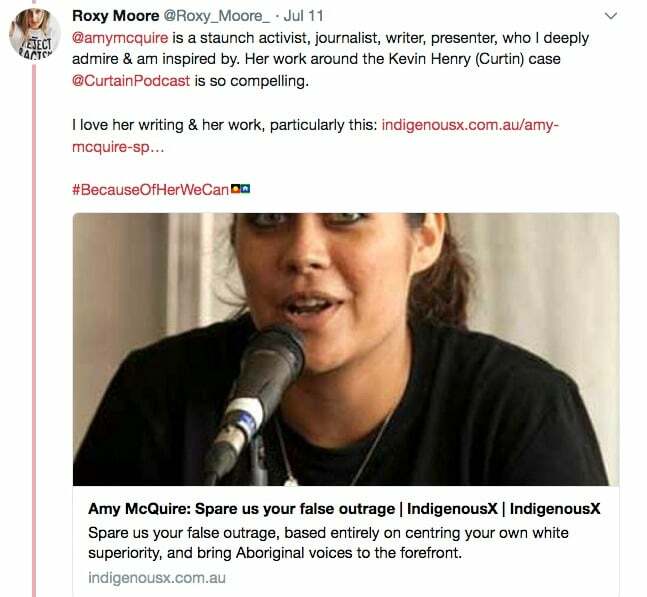 At @IndigenousX, read articles by Professor Heidi Norman, Karen Wyld, Daniel James, and Aimee Woods. 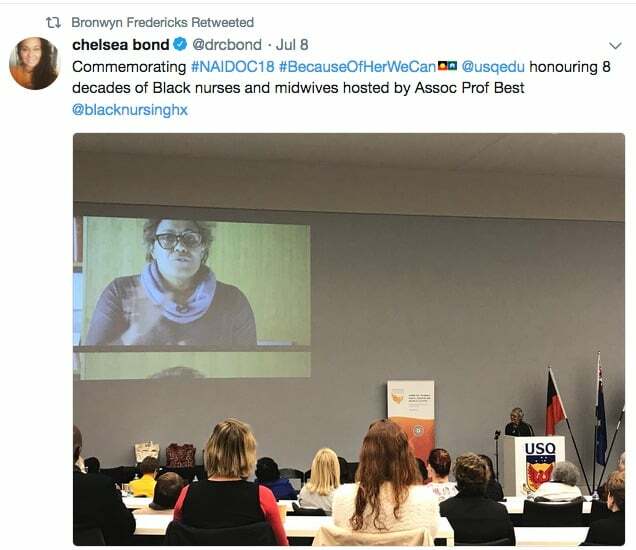 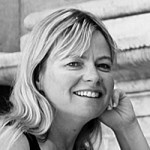 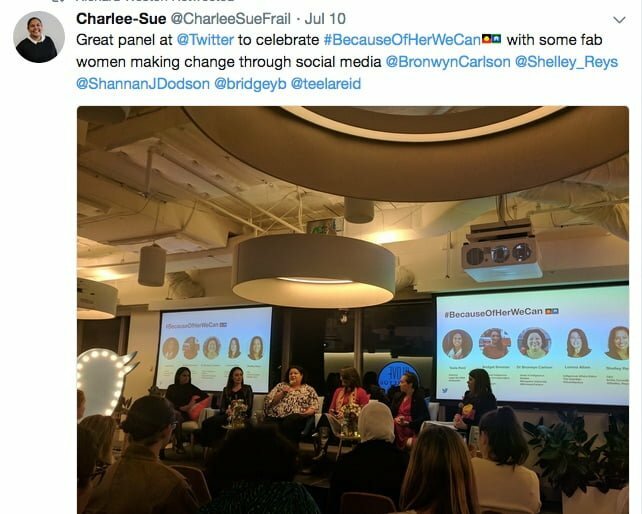 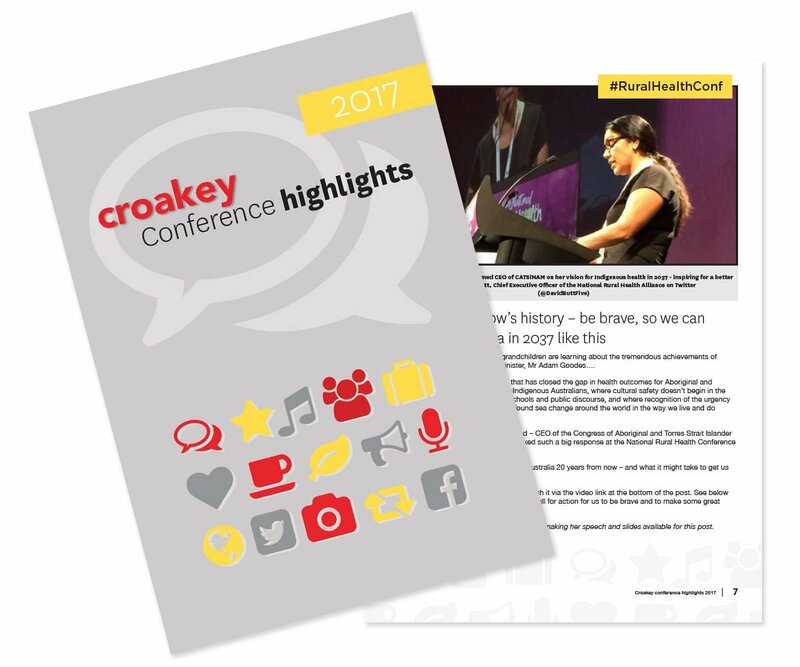 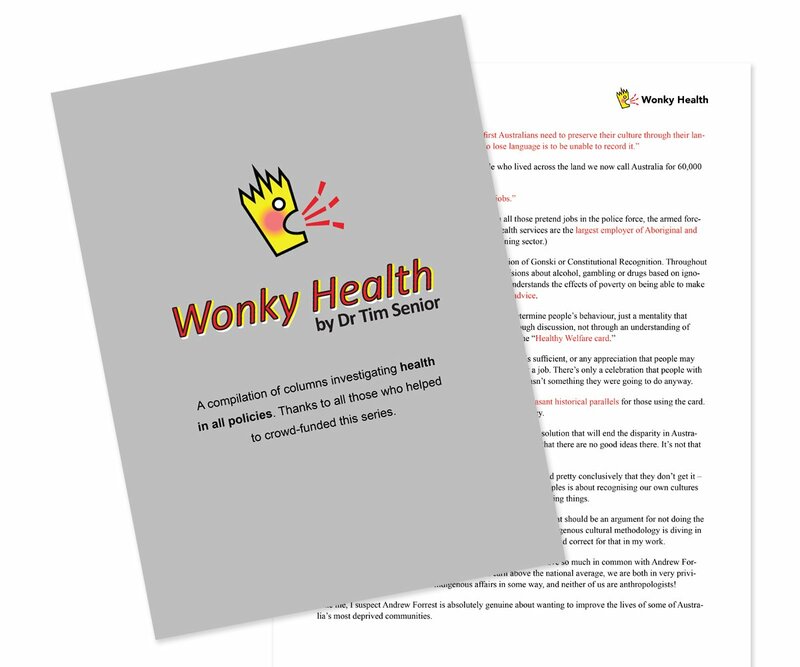 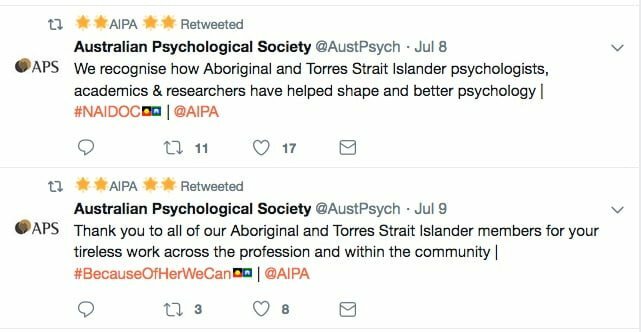 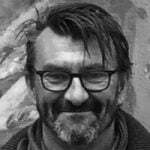 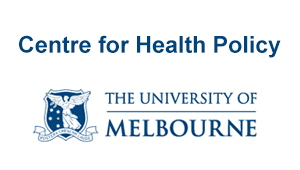 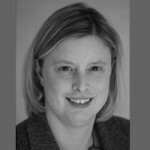 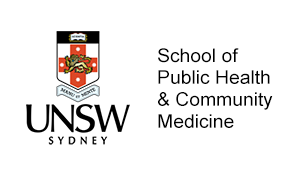 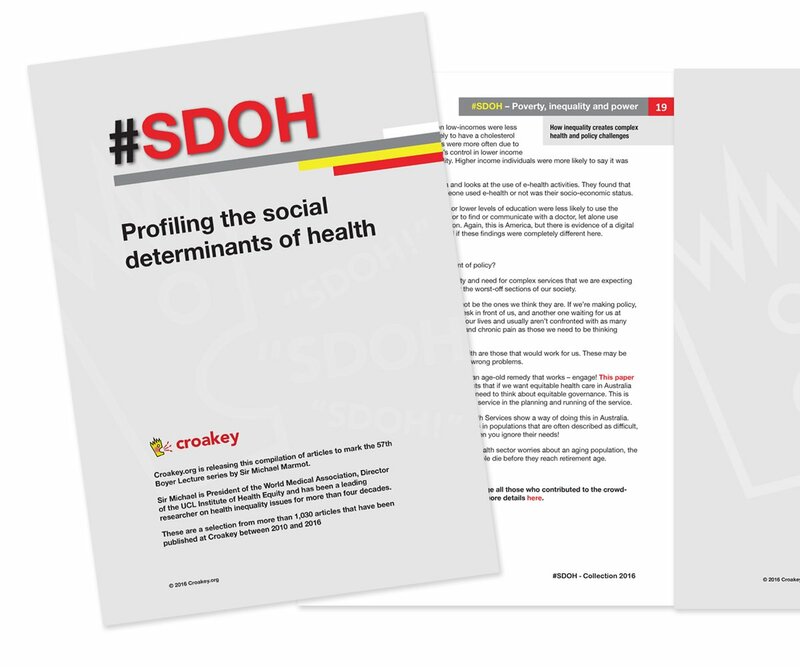 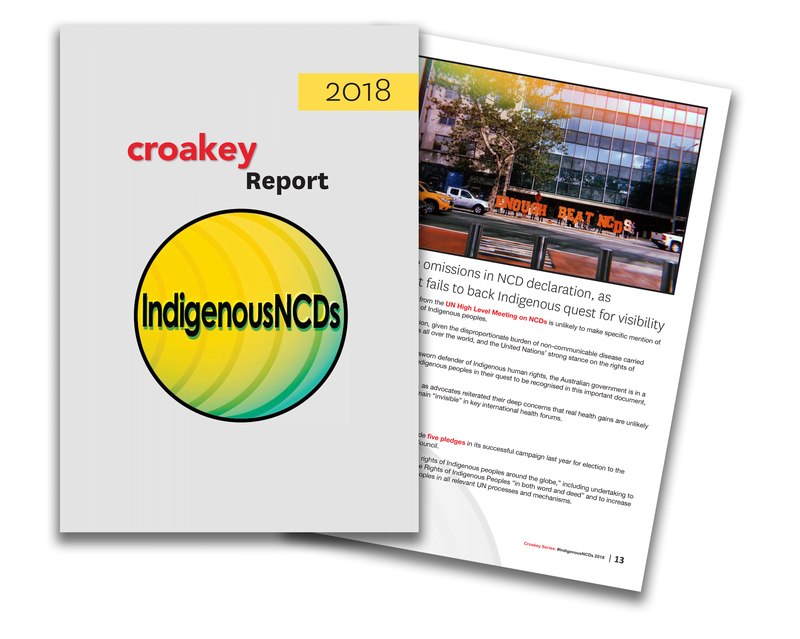 • Croakey thanks and acknowledges Dr Odette Best, Professor Bronwyn Fredericks, Dr Chelsea Bond and Roxy Moore for permission to cross-post their Twitter threads.